N.B. : At or before maturity the contract can be canceled by reversing the position. If at maturity the contracts no longer wish to make delivery (SHORT) of or take (LONG) delivery of the underlying commodity, the position can be closed out as above, otherwise, all remaining open contracts go through the delivery process. Execution Futures contracts trade on an “exchange”, electronic or telephone. Futures Options still trade on exchange floors due to the complexity of order types. 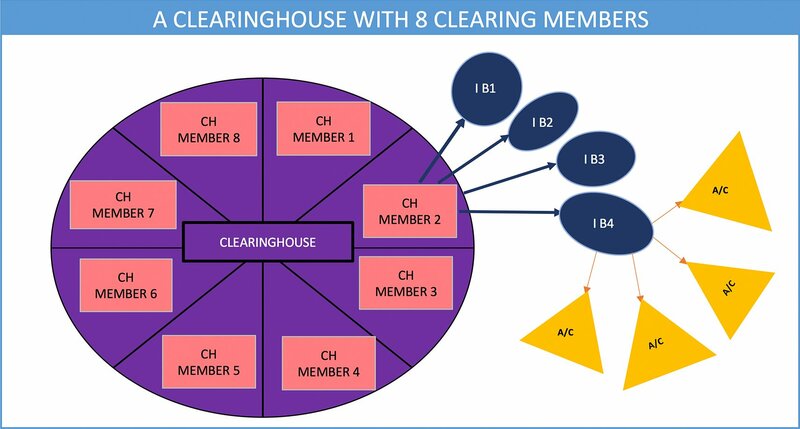 Clearing All Futures contracts are cleared at a Clearinghouse In the US futures exchanges had their own clearinghouses. Each futures contract traded and cleared on the same exchange. As trading moved to electronic market and a wider range of types of crude oil’s trading, Clearinghouses for each product are not as connected to the execution location. Clearinghouses are Organization of Mutuality that is the risk belongs to the owners of the Clearinghouse. If a client defaults on a trade, i.e., cannot post more margin, the introducing broker has a choice: they can cover the loss themselves, or if they’re unable to afford the loss they can bring it to the clearinghouse committee. Each member will share in the loss on a pro-rata basis. Initial Margin = $3,190 Both long and short post $3,190 for each contract they want to keep open overnight. While they may choose to get out of the trade when Asia or Europe are trading, they will have to post $3,190 to their US-based clearinghouse. Variation or Maintenance Margin = $2,900 Maintenance margin is a trigger. 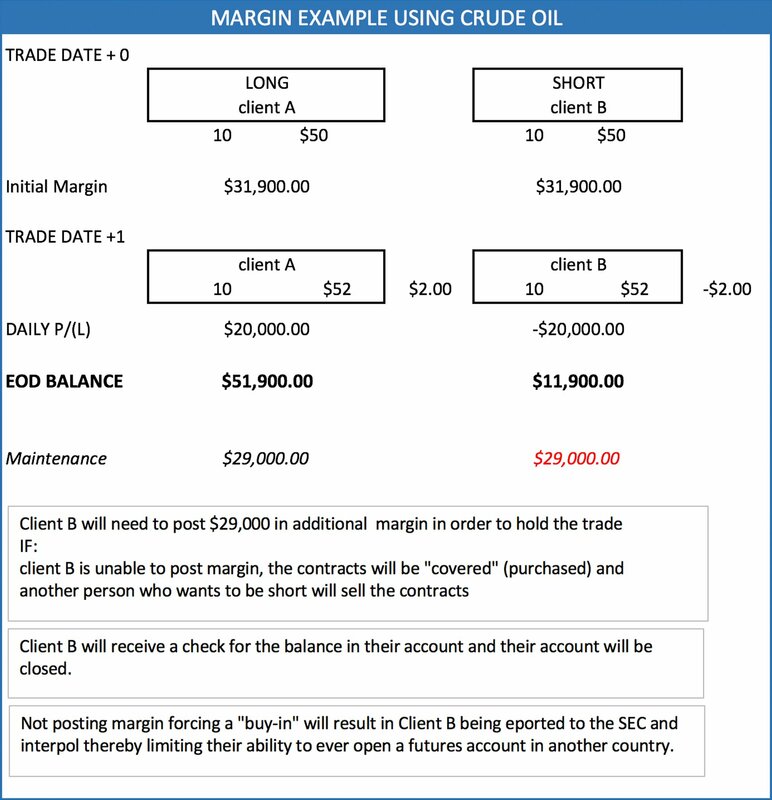 The client will be called for additional margin if the account falls below the maintenance level. During the credit crisis, Maintenance Margin wasn’t used and some firms have chosen to maintain that policy. Herefore a client must always have the initial margin for the contract set aside in a segregated account as a good-faith or performance bond. Check with your broker prior to trading so you know their specific guidelines. Volume: Contracts traded during the trading day. Volume is additive throughout the day. Open Interest: Open Contracts held in position. Open Interest measures the net OPEN contracts. If a market has very high daily volume, but open interest remains stable, one could surmise that market has more speculators involved in that market. By contrast, a futures market with high volume sporadically but where open interest grows on those days and progressively over the life of the contract, one could surmise that market has more hedgers involved than speculators. Any market we look at, we need to understand who uses the product and why. It’s worth saying at the outset that derivatives contracts, in general, have four participants. Viewing the diagram below, you will see two participants on top labeled HEDGERS. These are your participants needing futures contracts to hedge their actual business risk. A scan to the bottom of the diagram will show you the speculator and arbitrageur. These participants are our leveraged players. They use the derivatives market for the leverage it offers and provides liquidity to the hedgers. Going forward you may want to look at the type of participants in a specific product you’re viewing to see if all four participants are in the market. Without all four participants actively trading the product, the contract is unlikely to provide significant liquidity and transparency. An end user of grains and sugar such as Kellogg & Co. doesn’t buy & store their corn, wheat & sugar all at once. Rather they make their purchases periodically over the course of the year. This way they don’t bear the risk of spoilage or the cost of storing the raw products. If the price of their commodity goes up, they will have to pay a higher price to make their product. Companies can choose to take this risk or they can choose to hedge it. Companies can hedge their price risk directly with the producers of the products or they can choose to hedge using futures. Futures, cleared through a central clearinghouse provides anonymity, price transparency and the mitigation of counterparty risk. The trade-off of using futures & central clearing is the company doesn’t get the exact product they use, delivered to the exact location they need. They take “basis risk”, which we’ll discuss in a moment. End producers create a product or make a raw product usable. For example, refiners buy crude oil and refine it into gasoline & heating oil. Kellogg’s purchases grains from farm consortiums. The farmers are the End Producers of corn. End producers are at risk to the price going down. To hedge their market risk they could contract directly with the end user when it’s ready for sale, or they can use futures to hedge their price risk. 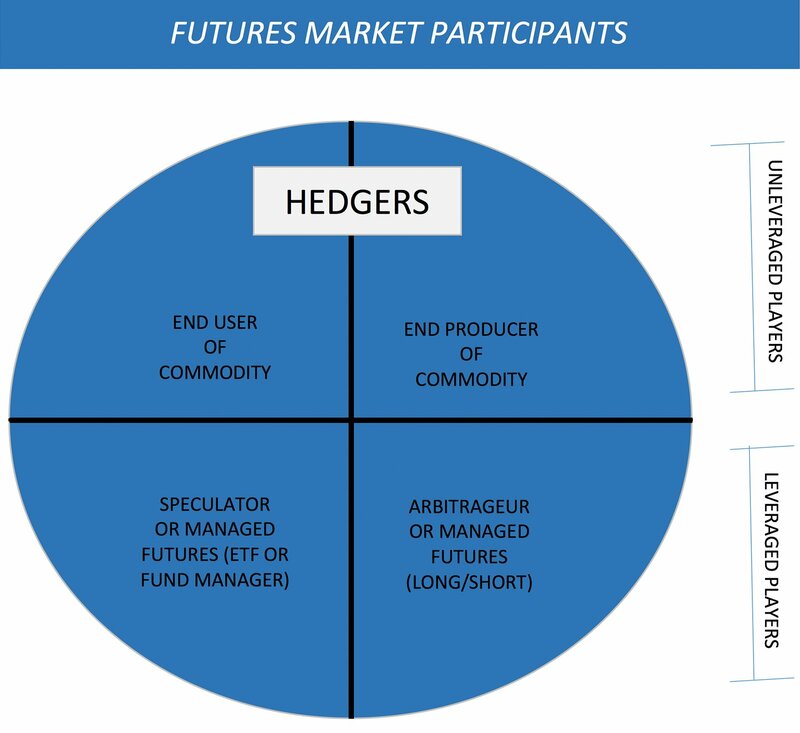 The end producer, such as the farm consortium choosing to sell futures makes the same trade-off as the End User. By using a central clearinghouse, their advantages include anonymity, price transparency and the mitigation of counterparty risk. The trade-off is that the futures contract may not call for delivery of the exact product they create or delivered to the same location where they are located. The producer takes “basis risk”, which we’ll discuss in a moment. “Leveraged players” in any derivative market describe those people who will borrow money to express their trade. 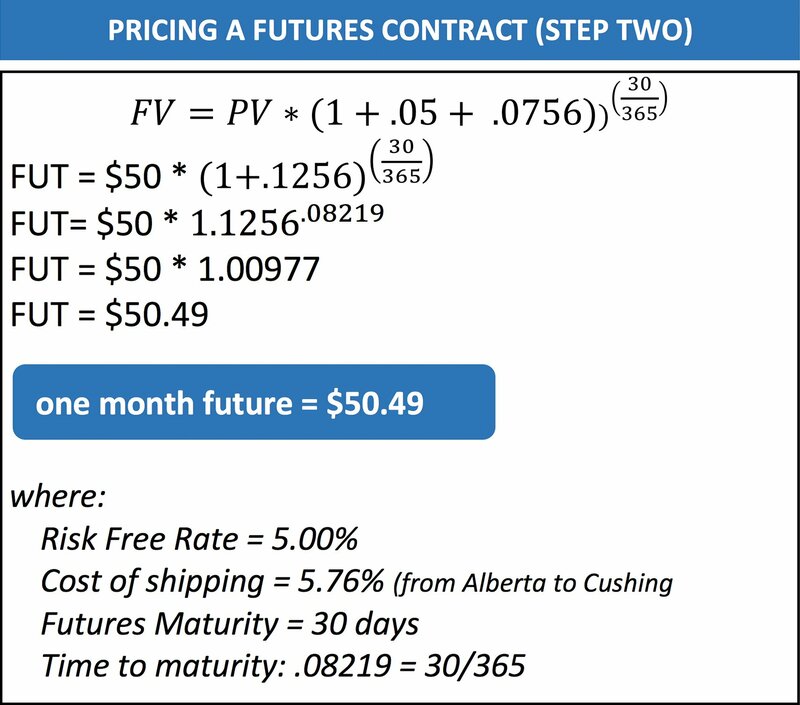 Futures contracts are leveraged due to the low margin cost relative to the contract value. 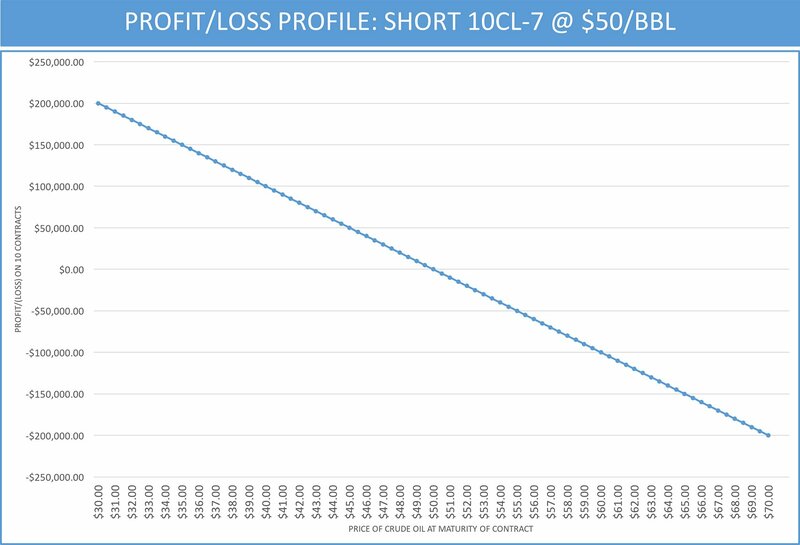 Recall our crude oil contract, with crude @ $50 per barrel = $50,000. Yet our initial margin is only $3190. The leverage of the contract =Initial margin $3,190 divided by the contract value $50,000. They have a leverage factor of 15.67 x margin (capital used). Margin levels can and will change as prices rise or the commodity becomes more volatile. Generally speaking, clearinghouses want initial margin to cover 3 times the average daily move. Or the average volatility of the most recent 3 days, whichever is higher. Speculators love leverage and with good reason. For a relatively small investment, they can reap great returns. Of course, the ever optimist living within us rarely chooses to look at the double edge sword. In a futures contract, you can LOSE MORE THAN YOU INVEST. Short-Term Speculators or Day Traders generally make their decision using technical analysis. Medium to longer-term speculators generally make their decisions based on the fundamental supply-demand of the underlying commodity. They may use technical points once they’ve decided to buy or sell in order to get the best price on the trade. Commodity Trading Advisors, structured product desks and commodity hedge funds would fall into this user type as well. Arbitrageurs take advantage of price anomalies between similar products when the price between the products reaches a level outside of normal range. The arbitrageur enters a trade, looking to reverse the trade when the prices between the products normalize. In effect, a market maker is also an arbitrageur. A market maker is a liquidity provider to the market. Their mandate is to provide a bid and an offer, prices at which market participants can trade. There is a misconception that arbitrage is exploiting an obvious mispricing in the market. There Ain’t No Such Thing As A Free Lunch (TANSTAAFL). Typically arbitrageurs are simultaneously buying and selling similar contracts. For example, an arbitrageur buying US crude oil and selling UK Brent crude oil will profit if US crude rises more or falls less than Brent Crude. This arbitrageur is still assuming risk on their trade and will lose money if Brent rises more or falls less than US Crude. Arbitrageurs look for anomalies in relationships between two. assets. The end user of crude oil is the refiner that needs to purchase oil at different points in time to refine the crude oil into gasoline and heating oil. The end producer of crude oil is the oil & exploration company. In the last section we covered market risk: we learned that end users of a commodity are at risk to the price of the commodity going up if they choose not to hedge. The end producer of a commodity has price risk of the commodity going down. Why do corporations hedge using futures? If they hedge directly with the buyer (seller) of their commodity, they will receive (deliver) the exact commodity at the exact location they need. But they lose the advantages of the clearinghouse and the price discovery/liquidity of active futures contracts. A clearinghouse offers more anonymity. A clearinghouse mitigates counterparty risk. 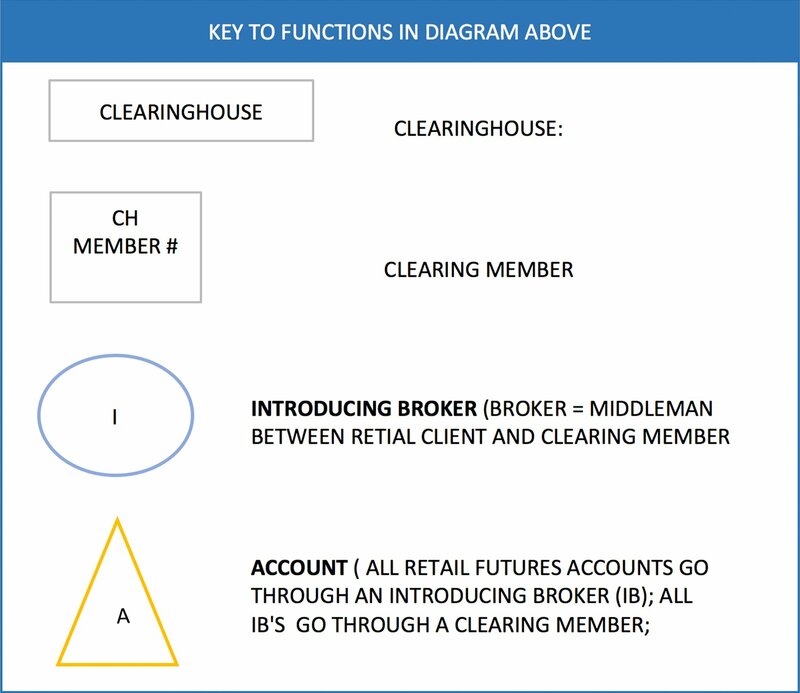 A clearinghouse provides more liquidity and price discovery so the hedger doesn’t need to give up price advantage due to a need to hedge. The hedger may have to get out of their hedge for a variety of reasons. Hedging with another commercial company will limit their ability to do so at a good price. Volume & open interest statistics show that many hedgers prefer to use futures. 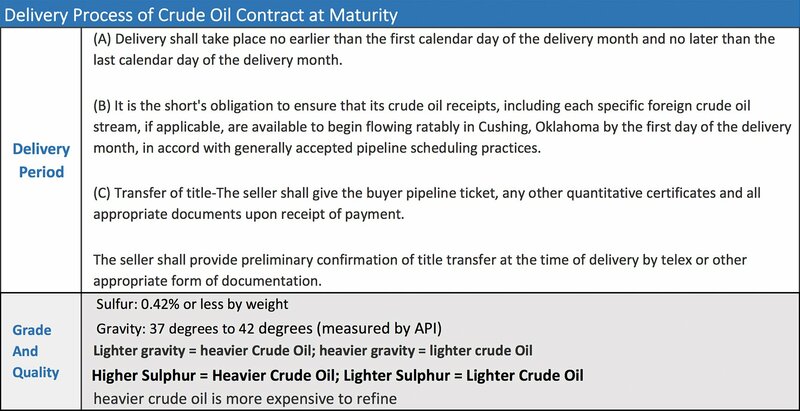 For example in crude oil only ~ 3% of contracts are still open & go through the delivery process. Further, as the open interest of the maturing futures contract goes down, the open interest of the next available futures contract rises. This shows the hedgers are “rolling” their positions into the next delivery month to maintain their price hedge. Other costs or income associated with the underlying asset adjust the Future Value number above. 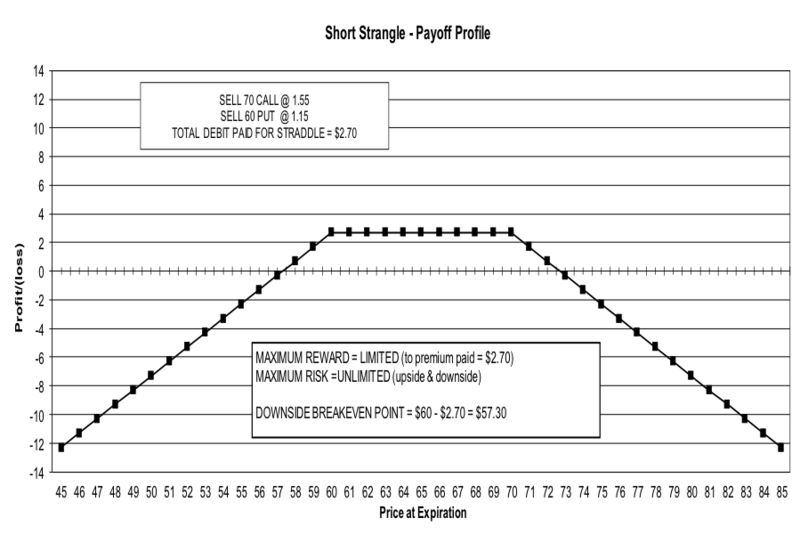 If our underlying asset were a bond, then we would include the income of the coupon. Transportation by Sea requires a bit of background, so this example will keep us on dry land. 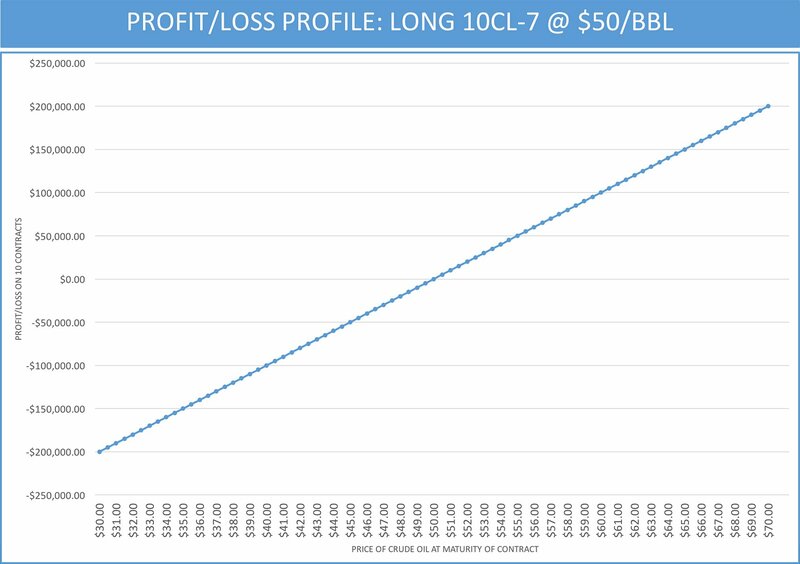 Due to larger tankers, investment in canals and other issues, historical numbers skew the cost of transporting oil. To get our futures Price and presume our oil will travel by pipeline from Calgary to Cushing, Oklahoma and stored for the remaining days. 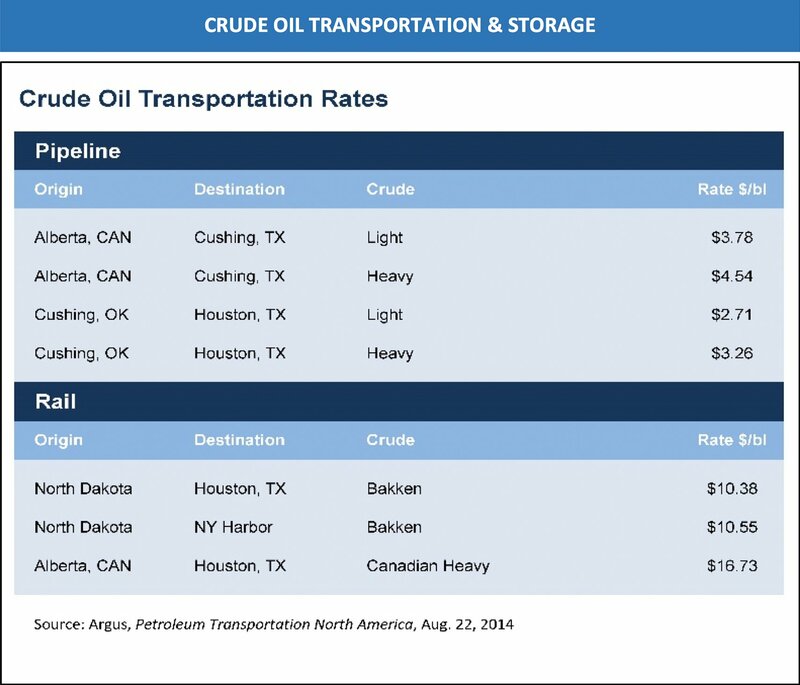 The total cost of storage and transportation for 30- days will be $3.78 per barrel. To make our calculation easier, convert it to an annual percentage figure: $3.78/$50.00 = 7.56%. 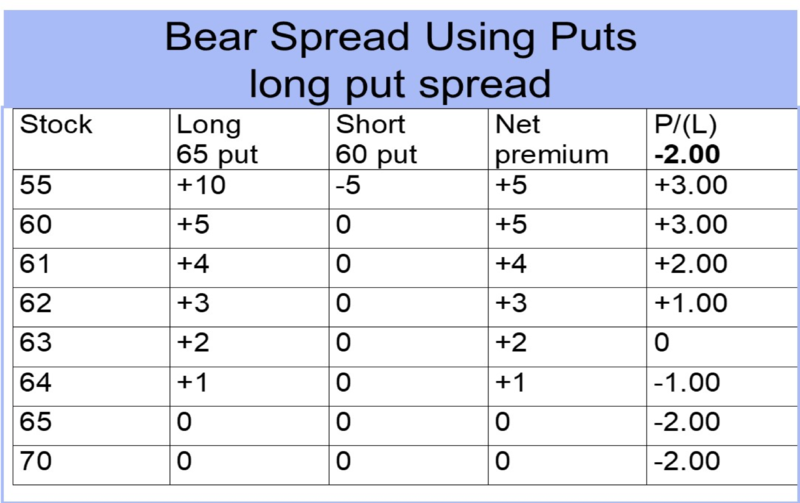 Hedging using futures is done using the SIMPLE HEDGE RATIO or the OPTIMAL HEDGE RATIO. The simple hedge ratio is more focused on the timing of the hedge. The Optimal Hedge Ratio also wants to adjust for the difference in volatility & correlation between the futures & the exact grade/location of crude oil the hedger buys (sells). Example: Let’s assume a refiner is looking to hedge his crude oil purchases beginning in April 2017. Recall the refiner buys crude oil to convert it into gasoline and heating oil. Our refiner needs to purchase a total of 150 million barrels of crude oil over four months from May to August 2017. 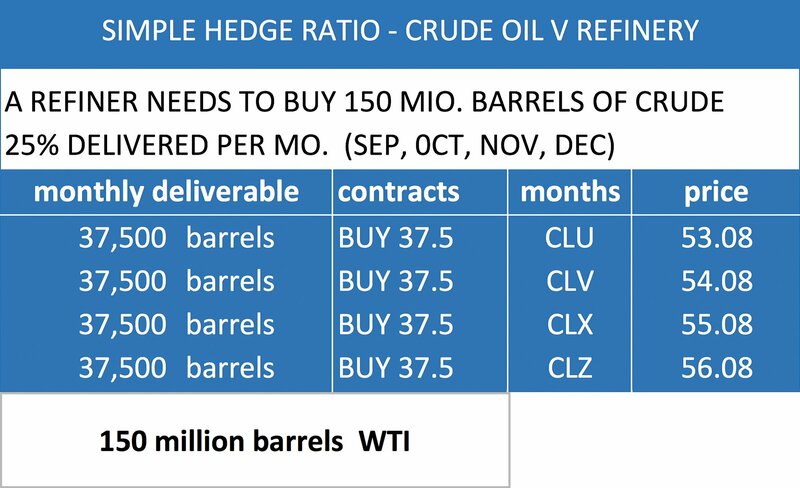 REFINER’S SIMPLE HEDGE = 150,000,000/1000 = 37,500 contracts each month from May, June July & August. REFINER’S SIMPLE HEDGE: BUY 37,500 May, June, July & August Crude Oil Futures. Let’s continue with the same example used to calculate the simple hedge ratio and introduce the concept of optimal hedge ratio. Our refiner still needs to purchase 150 million barrels over four months beginning in May 2017. But in reality, the crude he will purchase is Gulf Coast crude oil. His refinery is along the gulf coast and it’s easier for him to take delivery at that port. 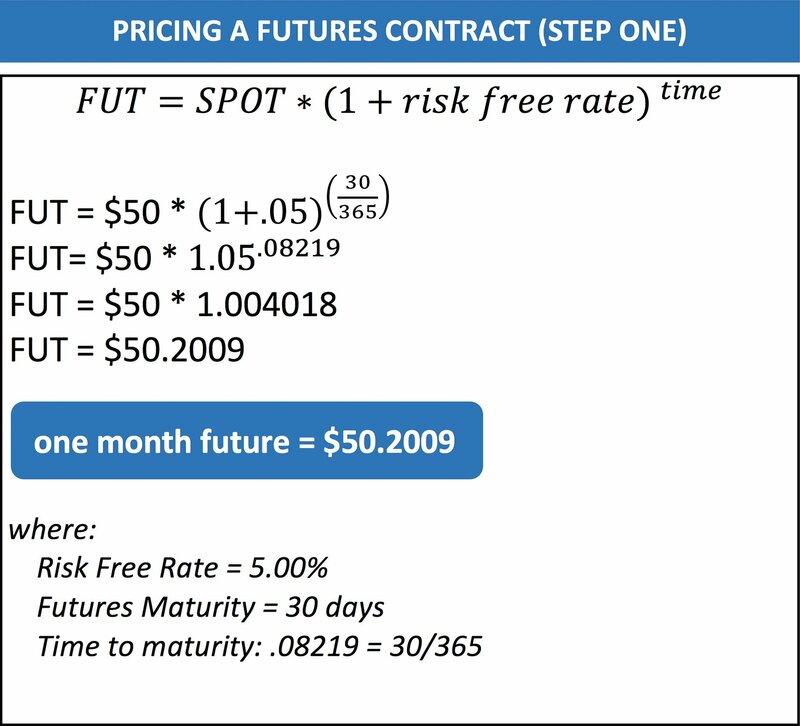 To hedge using the futures contracts we need to adjust for two major variables. 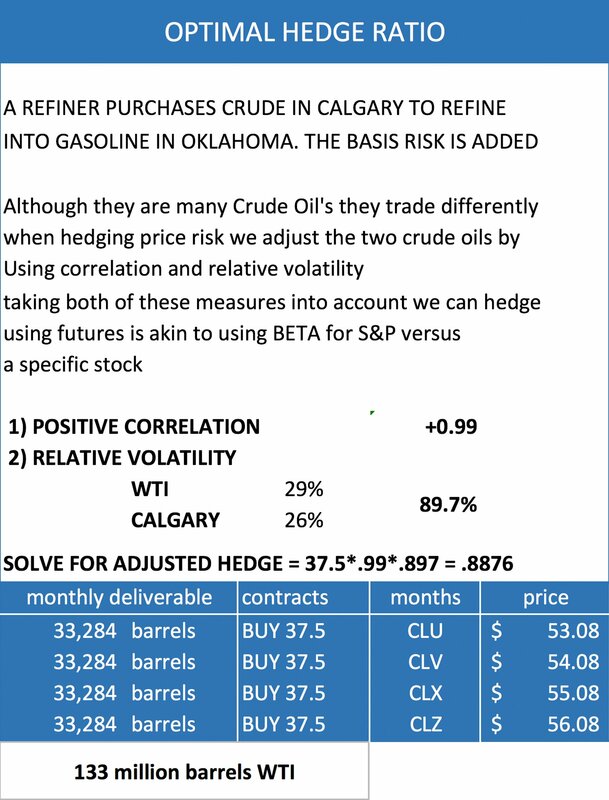 We need to adjust for both of these variables because even though we expect all oils to move in the same direction, if the two oils are less than +.985 correlated, the futures are not likely to be the most efficient hedge. Volatility measures something very different. Volatility measures the magnitude of price returns. If we buy too many contracts we will be over-hedged. If the price of WTI goes down more than we expected we will lose money using futures as our hedge. Adjusting for both of these variables the futures will mimic the performance of Calgary Crude. 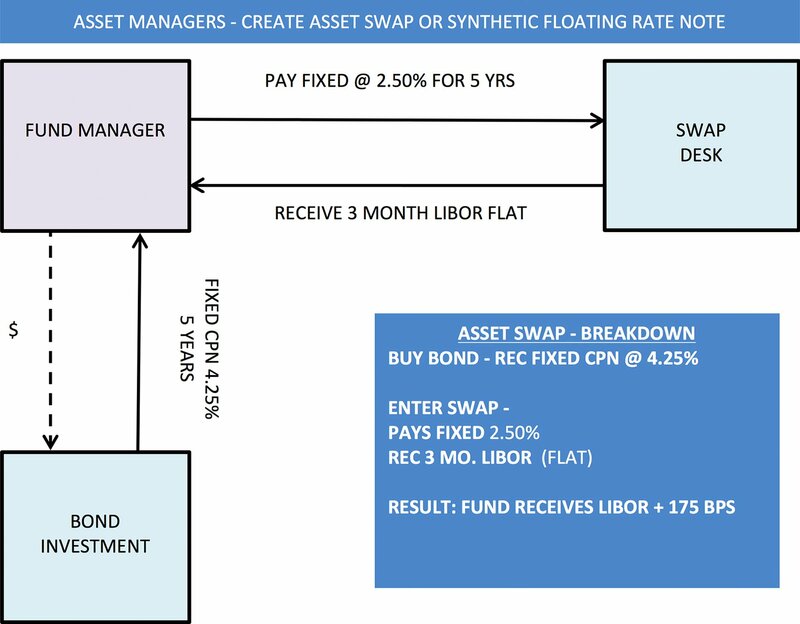 An interest Rate Swap is a contract whereby each counterparty gets to transform the type of risk management they run. Specifically, it’s a contract where the counterparties exchange a fixed cash flow, which will remain unchanged for the duration of the swap for a floating rate cash flow which will change at pre-defined times and using a pre-defined rate at periodic dates over the duration of the swap. 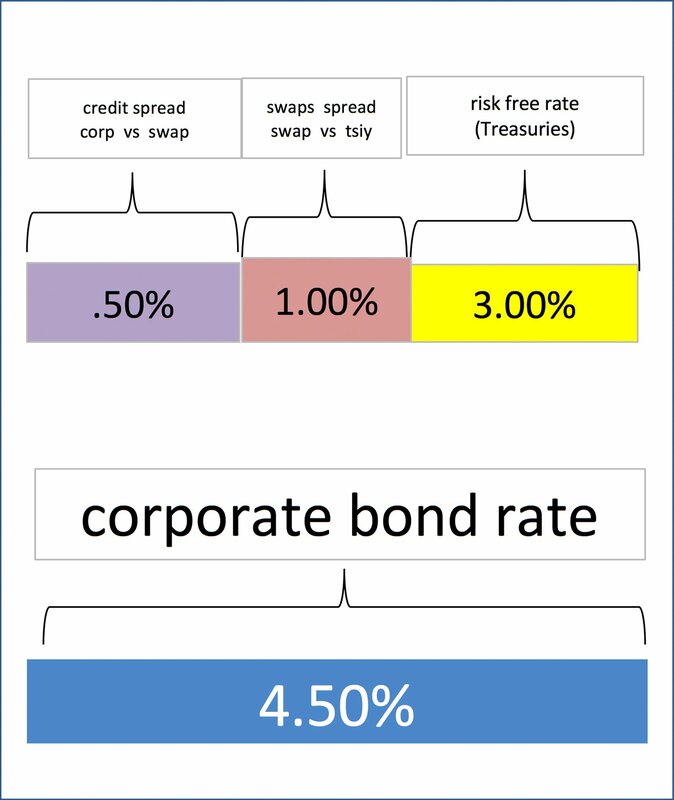 There are three ways to illustrate an interest rate swap. The first is called a box & arrow diagram. The third way is called the cash flow diagram. We will discuss this diagram in greater detail in the SWAPS PRICING section. To An interest rate swap is a contract where one type of interest rate is applied to one leg of the swap while the other leg’s cash flow is calculated using a different type of interest rate. For example: Fixed Pay for 5 yrs & Received 3 Month LIBOR The fixed leg will be paid for 5 years at the same rate The floating leg (LIBOR) will change every 3 months, for 5 years. If interest rates go down, this swap will lose money as the floating rate heir receiving is going down. When we speak about swaps, we speak in terms of the fixed leg. “I’ll pay fixed on $100 million for 5 years” It’s already implied I’m receiving the floating leg. PAY FIXED = make money if rates go higher RECEIVE FIXED = makes money if rates go lower. If you’re long a bond, you receive a coupon and make money if rates go lower. If you’re receiving fixed on a swap you make money if rates go lower. If you’re short a bond you pay the coupon and make money if rates go higher. If you’re paying fixed on a swap, you make money as rates go higher. To convert the language from futures to Rates, recall with crude oil futures we spoke of End Users & End Producers as participants who would use Crude Oil Futures as Hedges against price risk. When speaking about other debt instrument relative to interest rate swaps, we speak in terms of the spread between the two products. Below is a corporation bond trading at 4.50%. Today, since interest rate swaps are so liquid, we would say the bond is trade +50 bps over swap rates. The 150 bps is partially the credit rating spread. But relative liquidity between the bond and the swap, the relative duration etc would also be taken into account. Another spread tracked closely is the swap spread. In the illustration below, the swap spread is 100 bps, the swap rate is 4.00% (US Treasuries + Swap Rate). With respect to interest rate hedgers, it may be worthwhile to discuss how corporations raise capital. Corporations can either borrow money from a bank, or if their credit rating is high enough and they are well known in the market can issue bonds in the public bond market. The determination will be which market they receive a lower rate. In the Interest Rate Swap Market the concept of Comparative Market Advantage is useful to understanding why each market participant uses swaps. As we go through the hedger examples, we’ll speak to this comparative advantage with respect to each player. 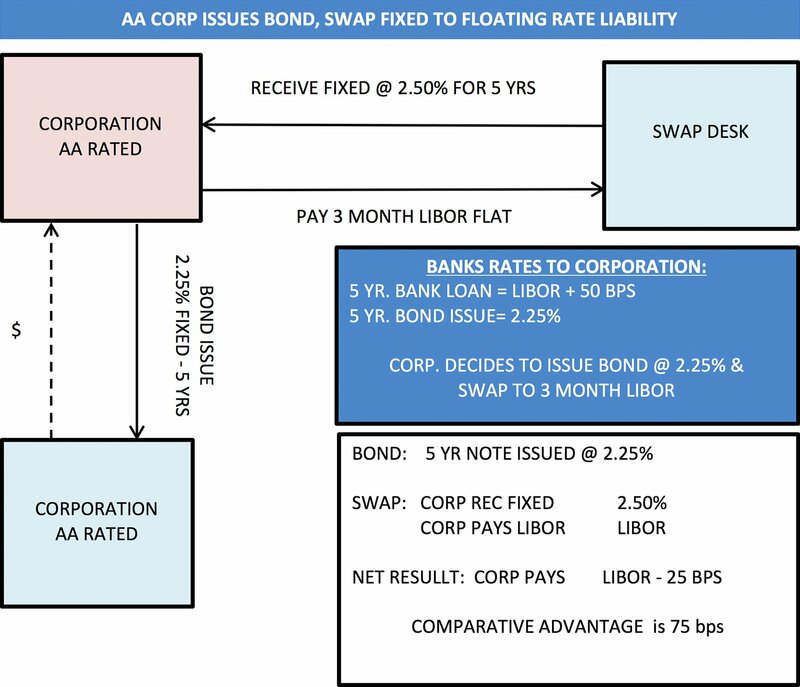 A AA-rated Corporation typically can borrow in the public bond market (fixed rate) at a lower rate than they would pay to a bank on a bank loan. They will issue a bond and pay a fixed coupon to bondholders. If the Higher Rated Corporation wants to pay fixed and it fits their asset-liability management, their fixed-floating mix and cash flow then they will remain in a fixed rate liability. If not, they will enter into a swap, swapping from a fixed rate liability to a floating rate liability. Let’s take a look. This AA corporate could have remained a fixed rate borrower for 5 yrs. There are several reasons why corporations choose to swap. In an upper sloping yield curve, 3 month LIBOR will be lower than 5 yr rates. The company’s interest expense will be lower. Most companies want a mix of fixed – floating liabilities. Depending on the type of business they’re in they will prefer 50% – 80% fixed rate liabilities. Conversely, they may prefer 50 – 80% floating rate liabilities. This is to create efficient cash flow. Example: an internet subscription corporation receives payments for their services every month. They may prefer to pay floating interest, even though they want to lock in the time for which they have use of the money. A BBB Corporation borrows from a bank (floating rate loan) at a lower rate than the public would lend them money, they will take out a bank loan and pay LIBOR plus a spread. If a Lower Rated Corporation wants to pay LIBOR and the bank loan fits their asset-liability, fixed-floating and cash flow mix, they will remain in a bank loan. If a Lower Rated Corporation would prefer to pay a fixed rate, they will enter into an interest rate swap to PAY FIXED AND RECEIVE LIBOR. 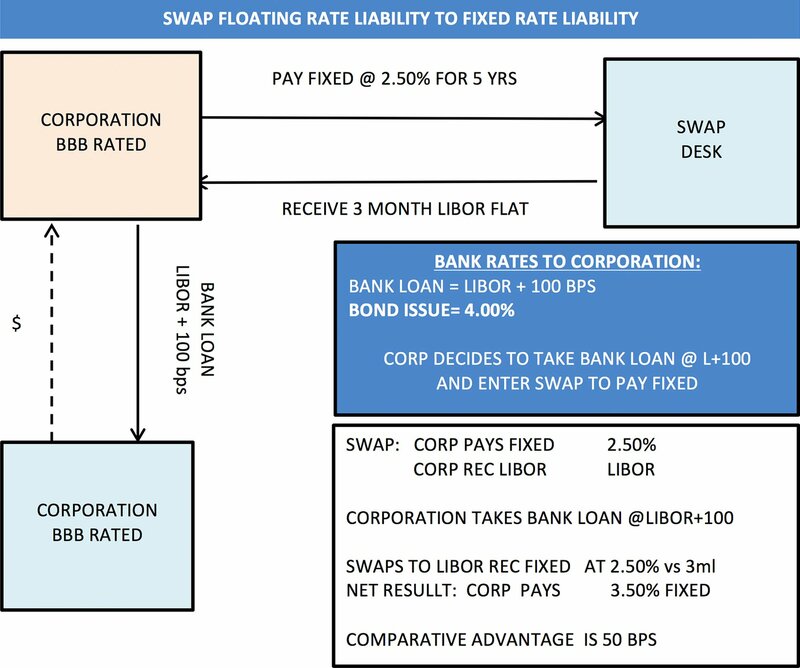 It’s worth noting that the interest rate swap provides flexibility for corporations to separate their source of funds from the way they manage their interest rate risk. As we saw with our AA borrower, they borrowed in the market which provided them the lowest rate. But due to the speed of their asset conversion cycle, as a subscription company, they can better manage their interest rate risk by borrowing LIBOR. Asset managers can also be seen as Lenders of money by buying bonds from corporations. The type of asset buyer we’re speaking about in the upper right hand portion of our participants circle is an unleveraged buyers of assets. 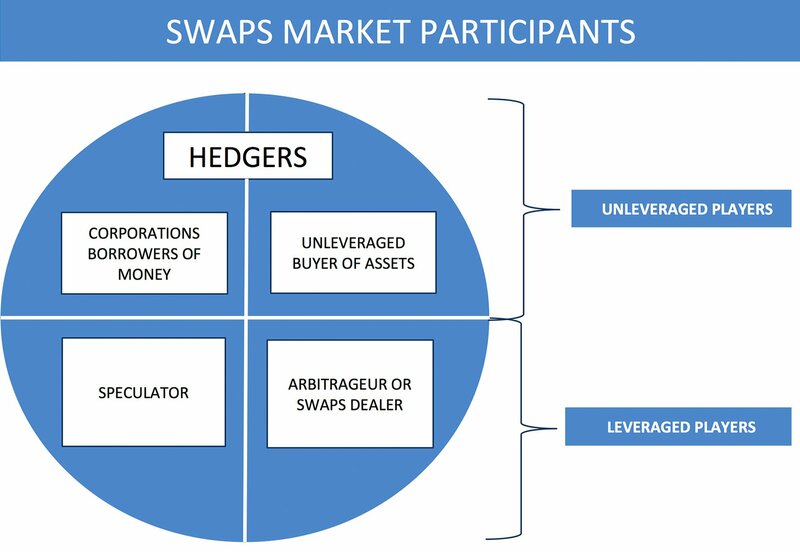 Asset managers use Swaps to create an asset swap. 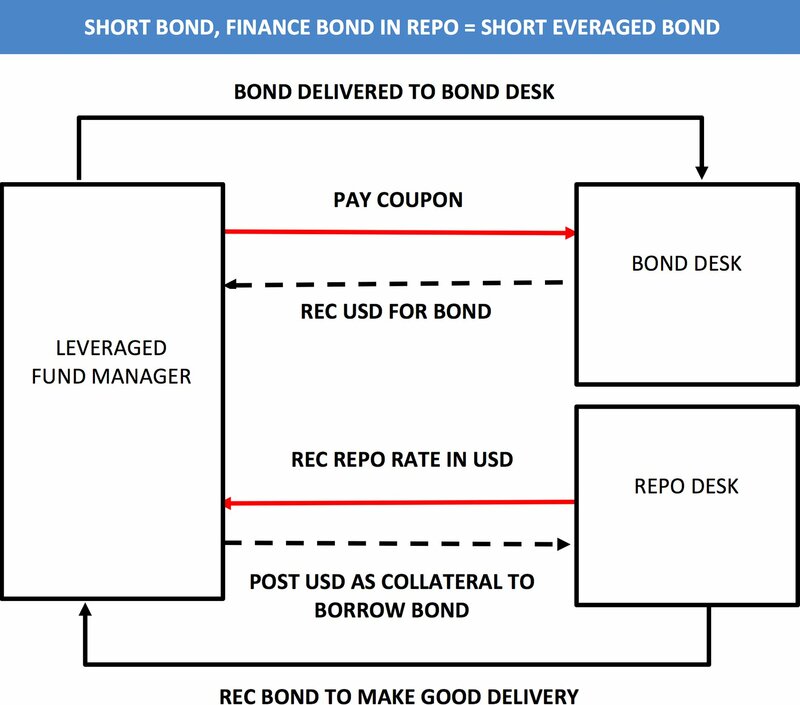 In an asset swap, the asset buys a fixed rate note or bond and enters into a swap to PAY FIXED AND RECEIVE LIBOR. The end result is the asset manager receives LIBOR plus a spread. Effectively they own a synthetic floating rate note. 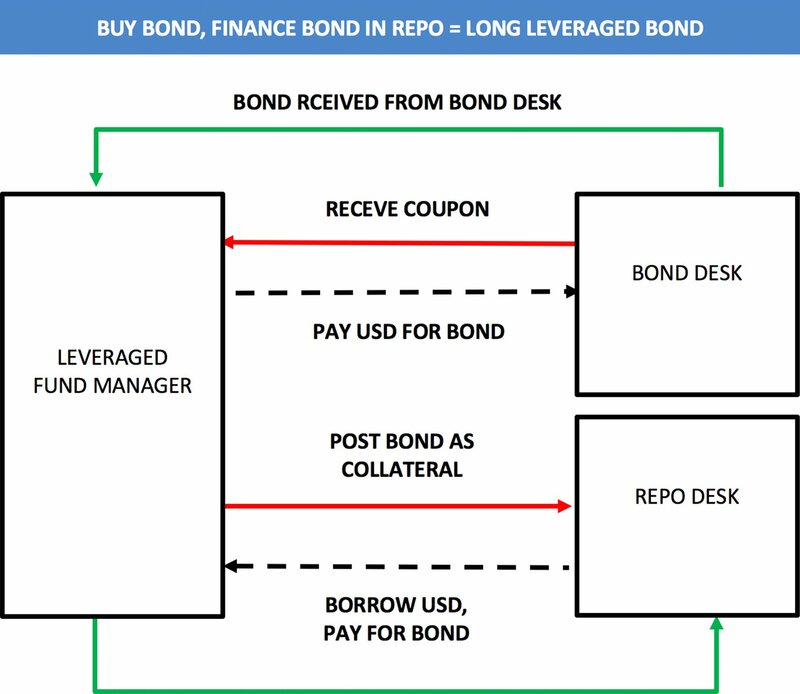 The asset manager can purchase the bond and enter into the swap on their own, as in the diagram below. Asset Managers also use interest rate swaps as a hedge. Asset managers are paid by client to outperform some pre-agreed bond index. That index has an average maturity or duration of the bonds included in the index. An asset manager can outperform their index in several ways. They can buy more long dated bonds if they think the market will go up or purchase more bonds of the corporations they like. Conversely, an Asset Manager may choose not to buy some of the bonds in the index because they don’t like the credit risk. However once a portfolio of bonds has been put in place, if the manager thinks the market will trade lower, managers don’t want to pay the slippage (bid-ask spread) of selling the bonds and rebuy them later. So they take an alternate route to hedging their rate risk. 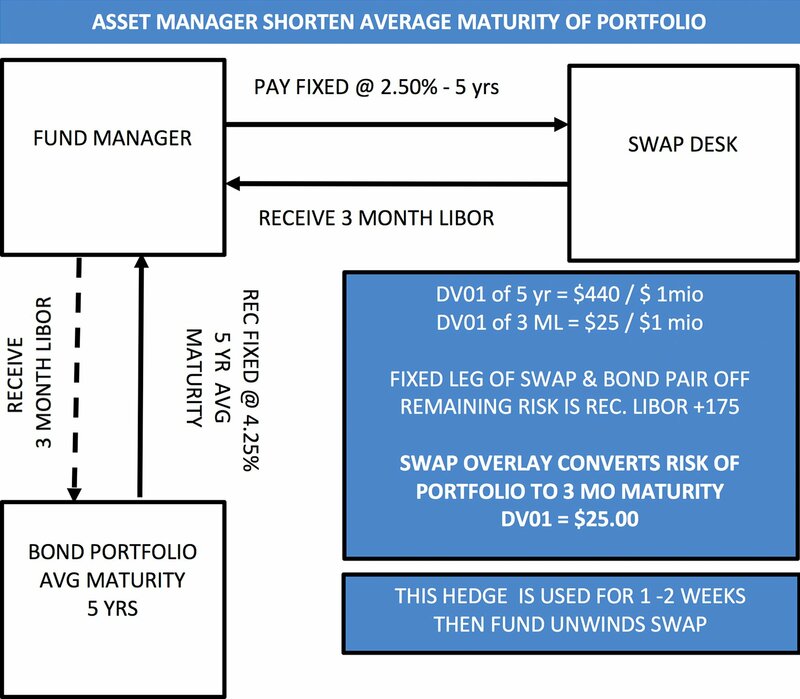 Asset managers will overlay an interest rate swap to shorten the duration of their portfolio. For those unfamiliar with DV01, it’s the amount the bond will change for a 1 basis point change in rates. By putting on the hedge 1:1, we’ve turned the portfolio into one similar to our asset swap. But for an asset manager whose index has a 5 yr average maturity, we need to look at the difference in risk to see the hedge. Earlier we saw the average risk was $481.96. With the hedge, the portfolio’s DV01 is now only$25!! if rates go up as expected, this portfolio manager will only lose $25 per basis point (for each $ 1 million invested). The unhedged portfolio manager will lose $481.96 per basis point (for each $1 million invested). This is NOT A LONG TERM HEDGE. This hedge will be in place for two weeks but not much longer. Once the market goes down, the hedge will be taken off. This type of brute force hedging, without refinement for the credit spread risk, etc. is not elegant, but it works. Particularly in fast markets. 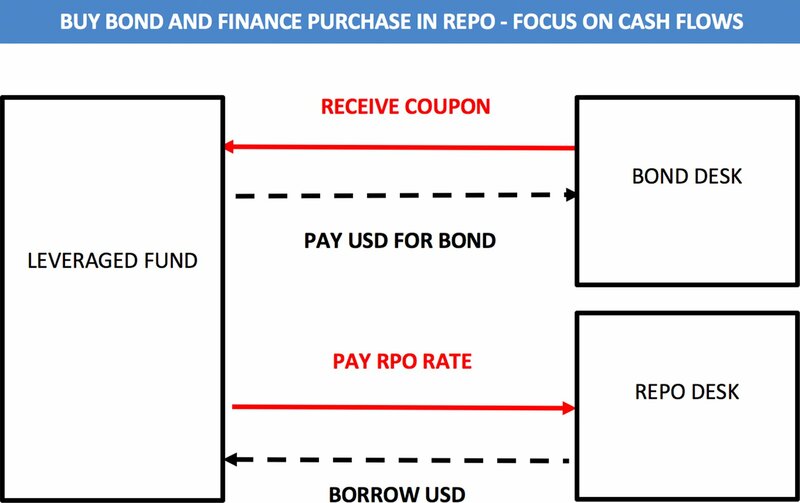 Looking just at the coupon flows, the position is receiving the fixed coupon on the bond and paying the repo rate on the financing of the bond position. The above doesn’t look much different with respect to the cash flows below. Credit rating of the bond position would be subject to whatever the credit rating of the issuing corporation (or sovereign entity) is. Credit rating of the swap is counterparty credit risk, which is mitigated by posting initial collateral on the swap as well as paying losses and receiving profits daily. 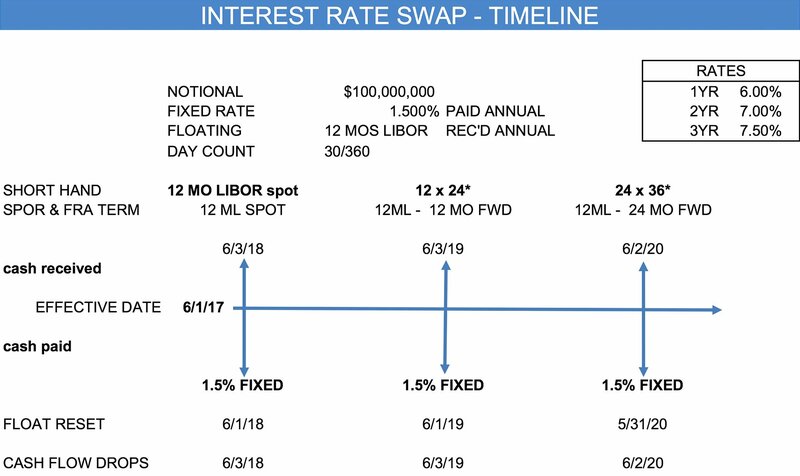 The floating leg on the swap is 3 Month LIBOR; the bond is financed at the repo rate, which is typically an overnight rate. The spread between 3 ML and Repo is fairly stable unless the bond is hard to borrow (“special”). Before we delve into swaps pricing, this section reviews the Time Value of Money, introduces compounding & continuous compounding. Then we’ll have all of the math necessary for this section and your further studies at MH. 1. 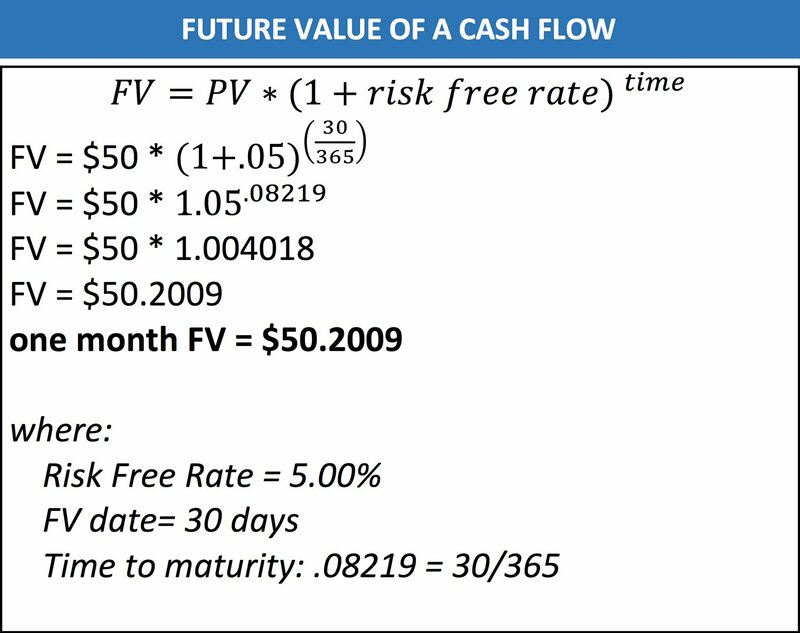 FUTURE VALUE calculates the value of a cash flow in the future for an investment made today. 2. PRESENT VALUE calculates the value of a cash flow today, presumed to be paid in the future. Compounding assume reinvestment of a cash flow received during the year. If I own a bond paying 10% and interest is paid semi-annually, the annual rate at year end will be more than 10%. The cash flow received at 6 months is reinvested for the remainder of the year. To calculate the compounded present value, we use the following calculation where R = the annual rate, C = compounding periods per year & t = time to maturity. To calculate the compounded future value, we use the following calculation where R = the annual rate, C = compounding periods per year & t = time to maturity. We use continuous compounding to convert all rates to a single compounding period so we can compare the rates apples to apples. To calculate a continuously compounded cash flow, we use the Exponent e notated (and used in Excel) as EXP where r = rate per year & t = time to maturity. Since we’re calculating the continuously compounded FUTURE cash flow, we leave the RATE ( r) as a positive number. if the contract is liquid enough to hedge the swap it will be liquid enough to price the swap. IF YOUR CONTRACT ISN’T LIQUID ENOUGH TO HEDGE THE SWAP OVER TIME, IT’S NOT LIQUID ENOUGH TO USE TO PRICE THE SWAP. The Timeline diagram shows the cash flows of a swap. 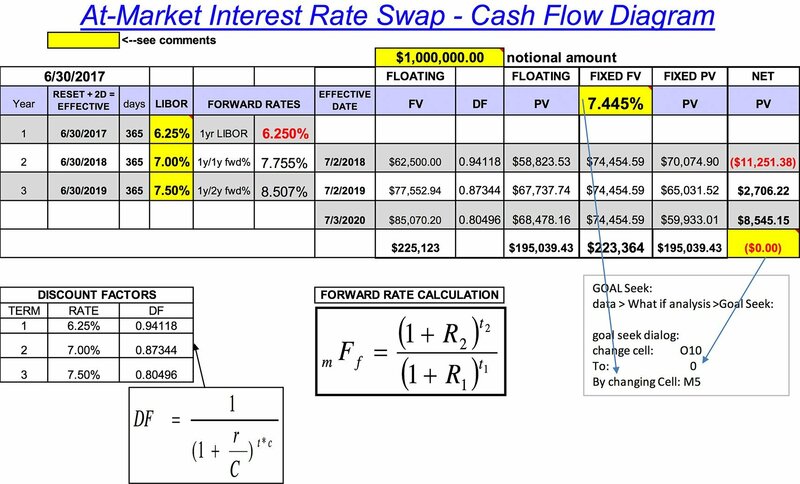 on the right-hand side you can see the floating rates we’ll use to price the following swap: $1 million; MATURITY: 3 years; PAY fixed; RECEIVE floating (both legs netted & paid annually) in order to price a new At-Market swap, the Net Present Value of all cash flows must equal zero. 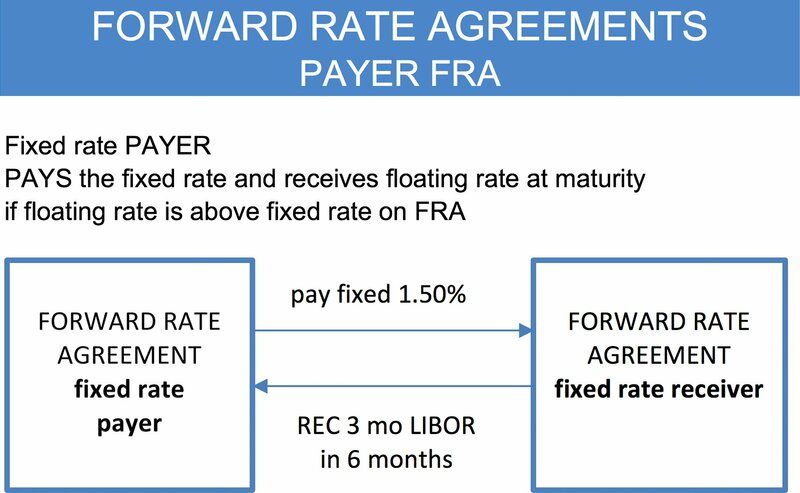 In order to find the fixed rate of the swap, we use the floating rates. After bringing the floating forward rates to present value, we iterate and solve for the FIXED rate which results in an NPV of zero. 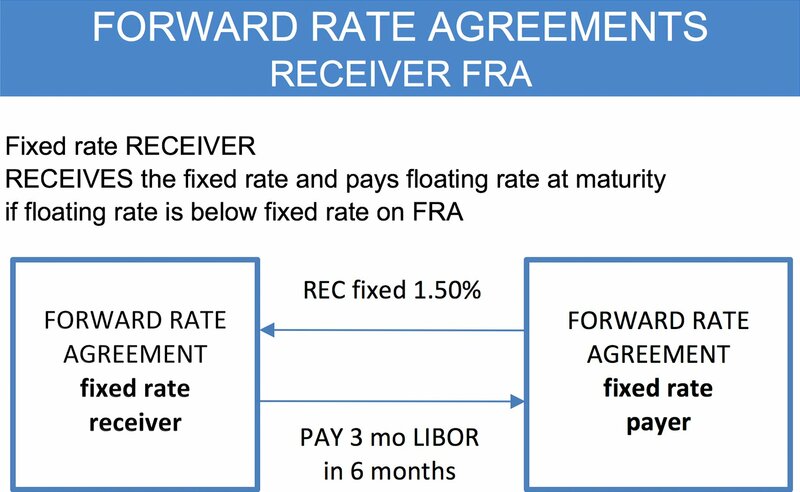 Forward Rate Agreements (FRA’s) are agreements to pay (receive) a fixed rate of interest and receive (pay) a floating rate at some time in the future (maturity). 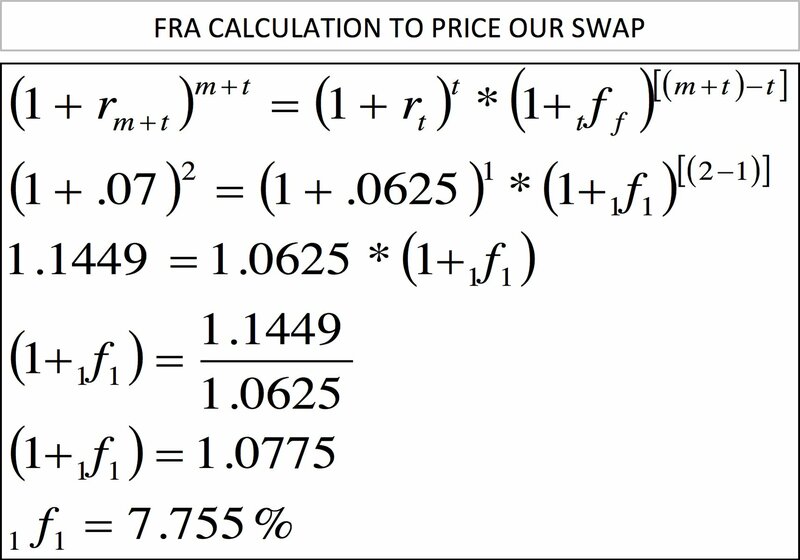 FRA’s are really single period interest rate swaps. In a payer FRA the payer agrees to pay a fixed rate at some date in the future, in exchange for receiving whatever rate is in force for that term to maturity. In a payer FRA you make money as rates go higher (prices fall). 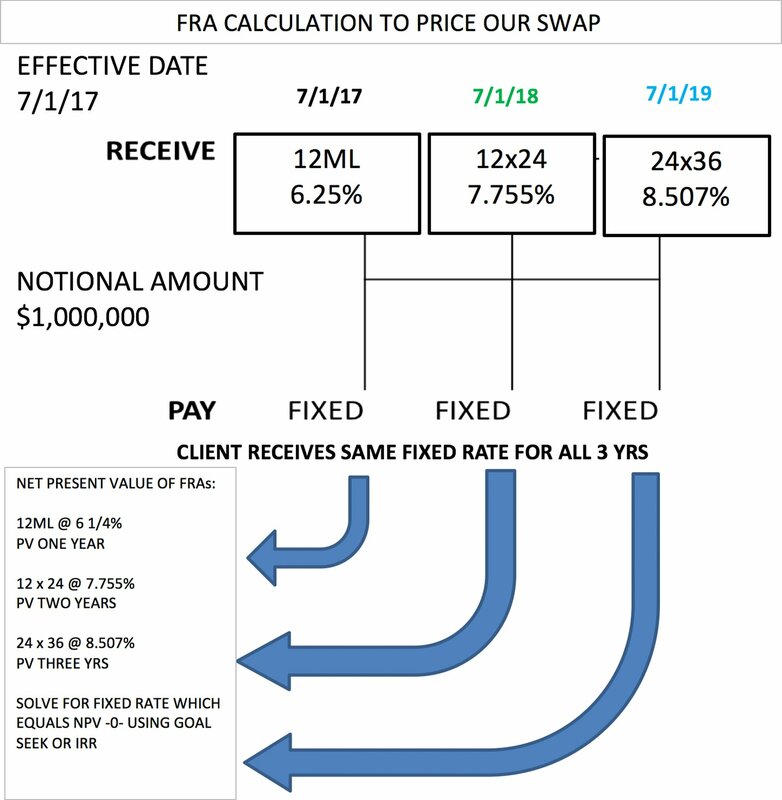 Now we have all of our rates & forward rates to price the swap. Here’s the resulting timeline showing the Rate Agreement (rate reset today) and the 2 forward rates 12 x 24 & 24 x 36. 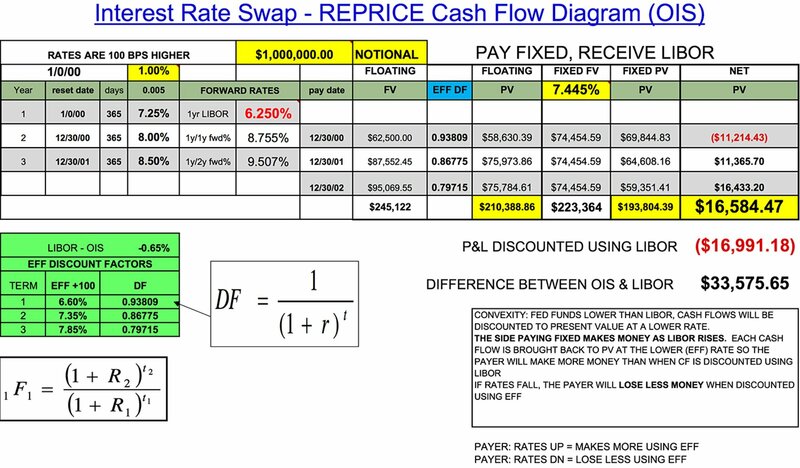 Next we’ll use a cash flow diagram and continue on with pricing each cash flow and then solving for the fixed rate on the swap. 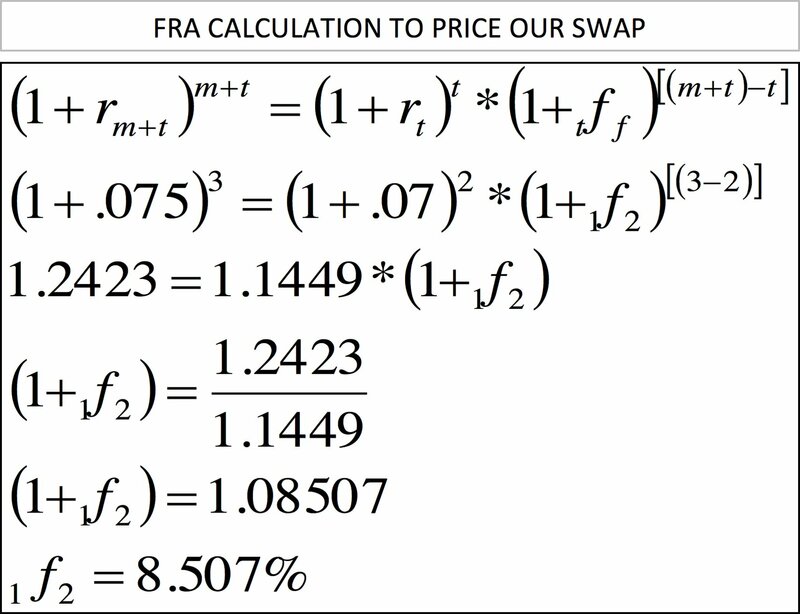 We use the FRA’s to get the correct forward rates for the swap, but for the swap to be priced fairly, we need all of the cash flow to come back to a NET PRESENT VALUE OF ZERO. Here’s a snapshot of the whole swap. Now we’ll go through the columns piece by piece. The first several columns are for Forward Rate Calculations. The forward rates can be seen in the right hand column with their title to the left. i.e. 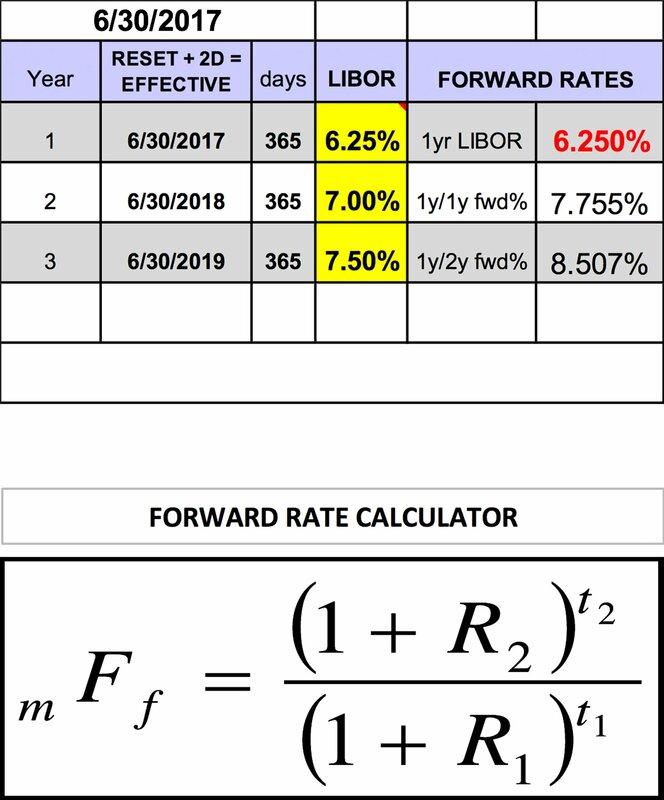 , 7.755% = 1 yr. LIBOR, 1 year forward. The next four columns are used to calculate the present value of the floating leg of the swap. The future Value is the notional &1,000,000 * the forward rates. The present value brings these cash flows back using the LIBOR rate for 1, 2 & 3 years. Not the sub-diagram Discount Factors. A Discount factor is the zero coupon rate or present value of one unit of currency. The discount rate used is the same as above 1, 2 & 3 year LIBOR deposit rates. The next two columns calculate the Present Value of the fixed leg of the swap, followed by the last column showing the NPV (Floating PV – Fixed PV). Notice, the YELLOW highlight around the cell atop the FIXED FV Column. Also note the column NET PV. 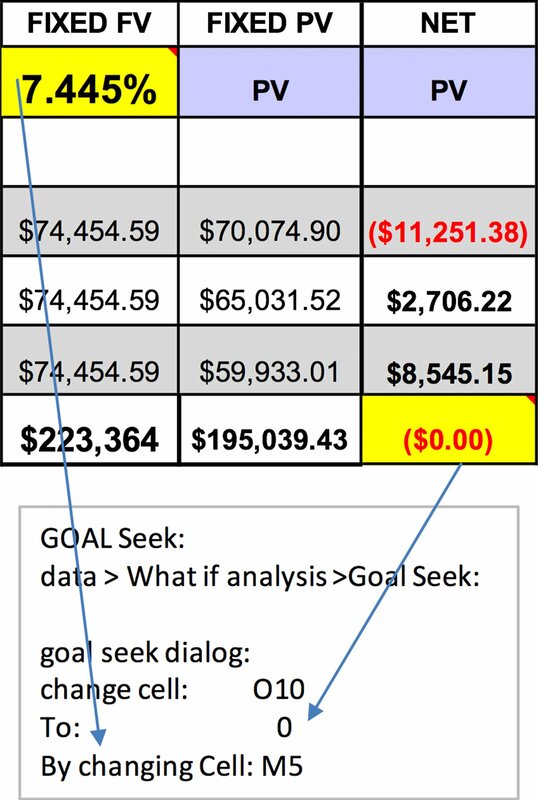 To solve for a Par swap, use Goal Seek (Data > what if analysis) the second choice down should be Goal Seek, if you don’t see this choice you will need to install your analysis toolkit. Using the goal seek functions as shown above, will give you the fixed rate at which all of the cash flow solve for an NPV of zero. Here is the spreadsheet in one piece. Note the forward rates are on the row above the cash flow. This tells us the floating rate is set in advance and paid in arrears. Both cleared and un-cleared derivatives are repriced the same way, using the OIS curve & the LIBOR Curve. 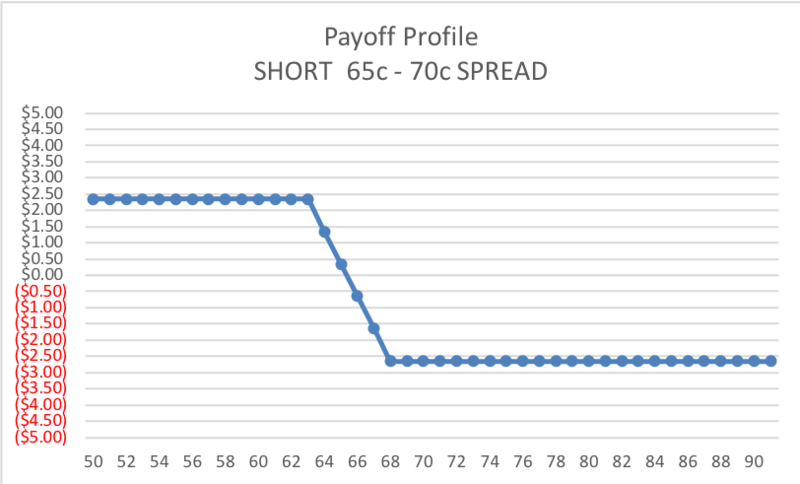 The OIS curve is used to calculate collateral calls. During the Great Credit Crisis and the reporting dealers forced the LIBOR reset rate lower, Since the LIBOR reset rate is used to reset all swaps & loans resetting that day, the rate impacts a large dollar amount. Market Participants decided, given the volatility of LIBOR a more stable rate should be used. The OIS Swap (LIBOR minus Effective Fed Fund) was chosen as the rate for COLLATERAL POSTING. Please note the difference: LIBOR curve is used to calculate Profit & Loss, but the OIS Spread to calculate the collateral one counterparty needs to post. What is the OIS Spread? The OIS Spread or OIS Swaps is the spread between LIBOR and the effective fed funds rate (EFF). Why don’t we just use Fed Funds Then? First, recall the Fed Funds are loans made between banking institutions CAN ONLY LEND THEIR FREE RESERVES IN THE FED FUNDS MARKET, and the market is short dated, it’s only liquid out 270 days. Where do we find OIS Spreads to Reprice Long-Dated Swaps? We use the OIs Swaps Market rates. Why? Because they’re so liquid. However there are other sources in the links section is you prefer to do your own work on the curve. The OIS swap is a floating for floating swap, LIBOR versus Effective Fed Funds. As with most floating – floating swaps, the maturity of the swap is long (i.e. , 5 yr swap) but the two floating rates are observed very frequently, with a net cash flow periodically. 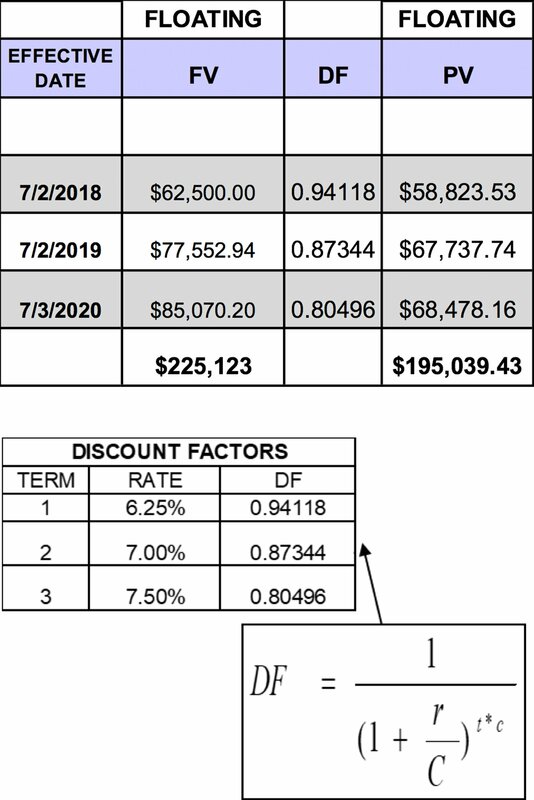 LEARN HOW TO REPRICE SWAPS USING OIS SWAPS AS YOUR DISCOUNTING RATE. Register for access to all free premium content or log in to your account. 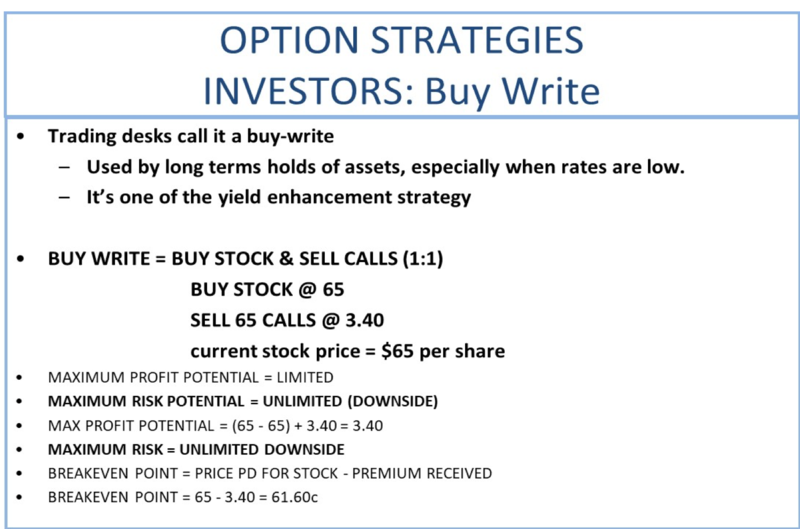 Options are the right but not the obligation to buy (call) or sell (put) the underlying asset. The buyer of an option pays a premium for their rights to the seller of the contract. A call is the right, but not the obligation to buy the underlying asset at the strike price prior to or on expiration date (depending on the expiration terms of the option). The buyer of the call pays a premium for the right. The seller of the call receives the premium in exchange for taking on the obligation of selling the underlying asset if the buyer of the call exercises. The call buyer is likely to exercise their right if the asset is ABOVE the strike price. A put is the right, but not the obligation to sell the underlying asset at the strike price prior to or on expiration date (depending on the expiration terms of the option). The buyer of the put pays a premium for the right. The seller of the put receives the premium in exchange for taking on the obligation of buying the underlying asset if the buyer of the put exercises. The put buyer is likely to exercise their right if the asset is BELOW the strike price. To price a call or put on the common stock of a public company, the following variables are known: Asset price – the current price of the common stock Strike price – exchange-traded options have fixed strike prices from the date of listing to expiration; OTC options have flexible strike prices until a trade is made. Once traded, the terms for setting the strike will be fixed). Expiration date – calculate the fraction of a year to expiration) Expiration type – American style options can be exercised any business day – European style options can be exercised only on the expiration date – Bermudan style options can be exercised based on a schedule agreed to by the buyer & seller Dividends – Any dividends which will be paid during the life of the option Interest rate – To calculate the cost to carry long stock or the rebate received on a short position from today to expiration day Volatility – The expected magnitude of price change between today and expiration day The diagram below shows the Theoretical Value & the Greeks for the option described. To the left of the words CALL & PUT shows the inputs defined above. To the right of the words CALL & PUT are the outputs of the Generalized Black-Scholes Pricing Formula. 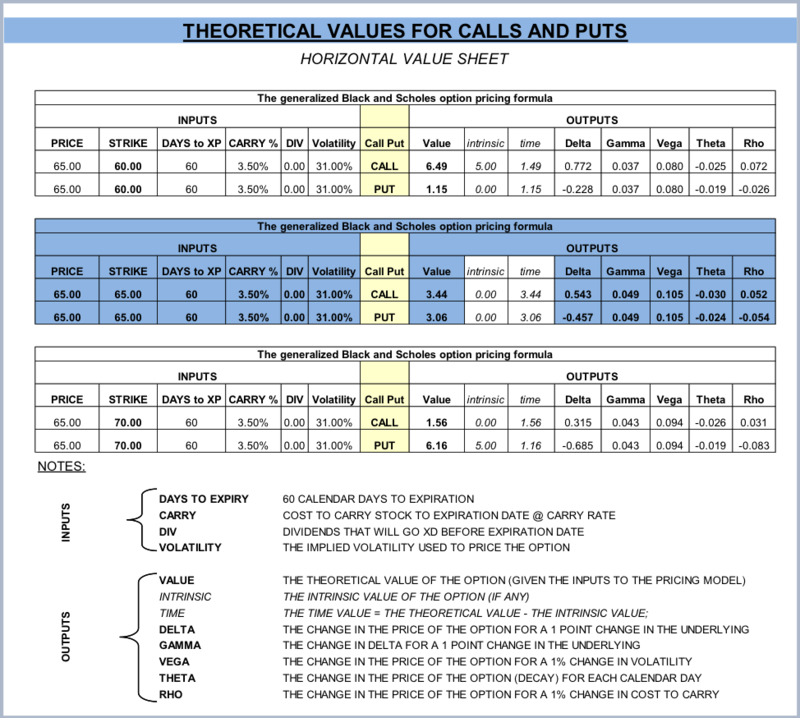 EXAMPLE (using long calls): Long $65 calls @ $3.40 Asset at $80 at expiration Intrinsic value is $15.00 Long exercises call and are now long stock at $68.40 Strike + Premium = $65 + $3.40 = $68.40 Long decides to sell our long stock at $80 Profit/(Loss) Profit = intrinsic value – premium paid Profit = $15.00 – $3.40 = $11.60 profit EXAMPLE (using short calls): Short $65 calls @ $3.40 Asset at $80 Intrinsic value is ($15.00) Short receives an assignment notice on the call Short sells shares $68.40 per share Strike + Premium = $65 + $3.40 = $68.40 Short decides to cover our short stock at $80 Profit/(Loss) Profit = intrinsic value – premium received Profit = –$15.00 + $3.40 = $11.60 profit It’s easier to recall the basics of options by finding shorthand ways to remember things. When you’re long options, you pay the premium. You have limited risk, unlimited reward. When you’re short options, you receive the premium. You’ve got unlimited risk, limited reward. Is the risk limited or unlimited? If risk is limited, how much? Is the reward limited or unlimited? If reward is limited, how much? What is are the breakeven points? 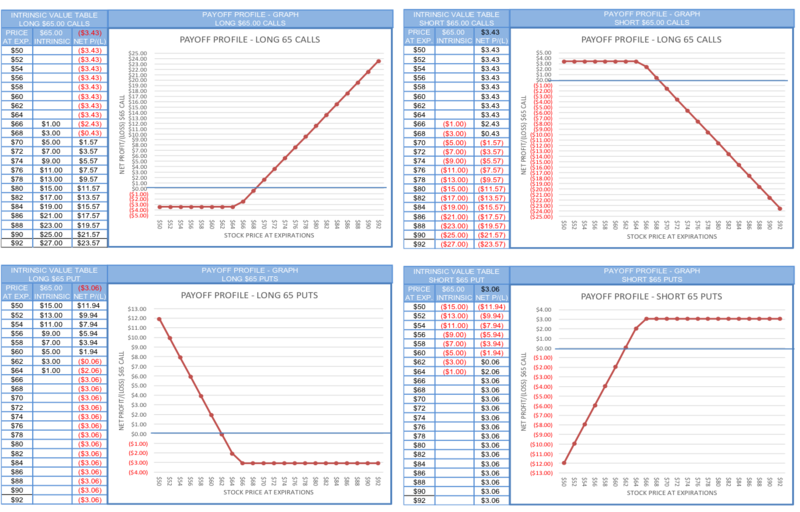 Using the option prices above the graphs below show the payoff profile graph at expiration: long call, short call, long put & short put. Viewing each of the four illustrations above, on the left is an intrinsic value table. 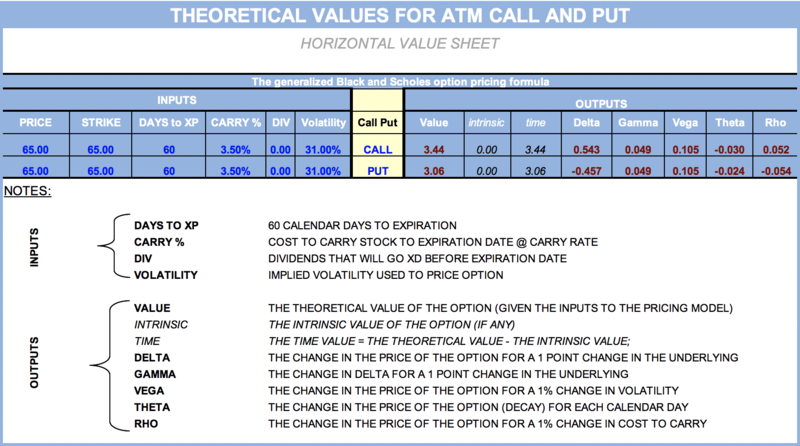 This table shows us the intrinsic value of the option or its price on expiration day. Note that long option positions show the intrinsic value in black (because we’re making that money) and in short option positions the intrinsic values are red (because we’re losing that money). This format makes it easy to calculate the profit & loss. The options above are European-style options, meaning the option can be exercised only on expiration day. As with any derivative product, the price of the derivative must equal the price of the underlying asset under the same terms and conditions. In the vernacular, we use the term “synthetic” when referring to the derivatives position. In the vernacular, we use the term “actual” when referring to the underlying asset. The asset is purchased for $65.00. When pricing derivatives we presume all underlying positions will be financed. Even if we’re not financing the purchase of the underlying asset we’re foregoing the resulting benefit (from interest on a savings account) if we didn’t finance the purchase. The spreadsheet above shows an Interest for 60 days of 3.50%. The interest or Cost to Carry = $65 * .035 / 365 * 60 = $.38. 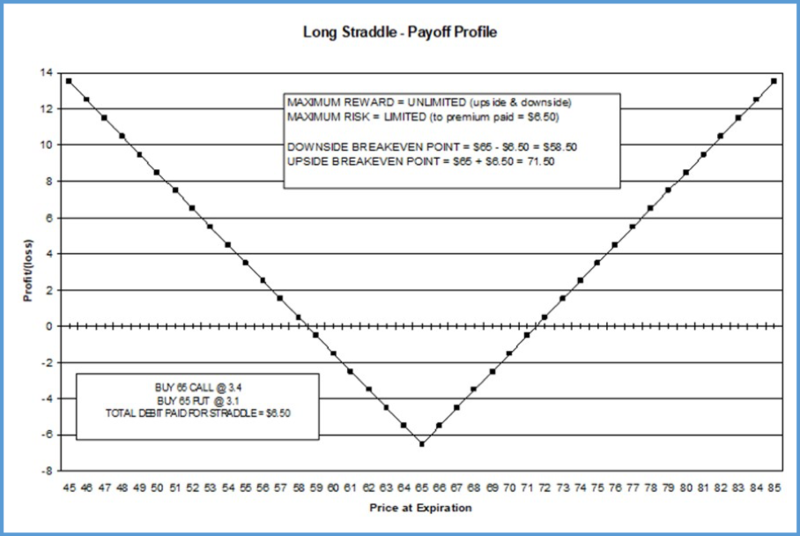 To create a SYNTHETIC LONG position in the underlying asset: BUY CALL & SELL PUT (same strike & expiration date). The 65 call costs $3.44 and put can be sold for $3.06. In 60 days, if the stock is above $65, the call will be exercised. If the stock is below $65, the put will be assigned. 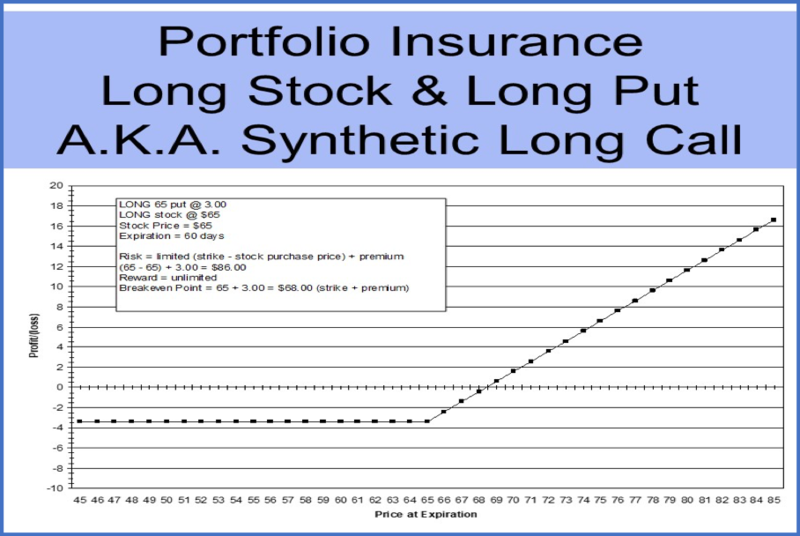 In the example shown, the net premium to create synthetic long stock is a payment of .38. If it were possible to purchase the “actual” asset at a cheaper price than the “synthetic” or vice versa, that would be an arbitrage. 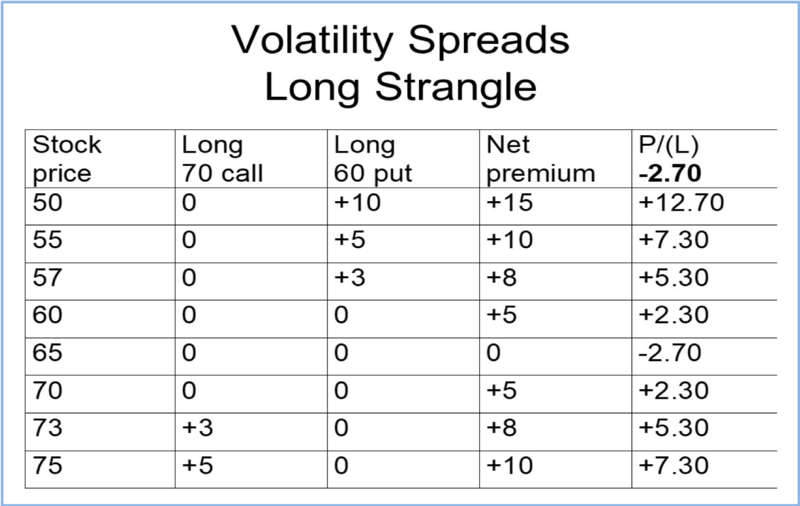 Rarely found nowadays in US markets, back in the late 1970’s when options first began trading on the exchange, this arbitrage showed up with regularity as the market became used to pricing options. We called these positions conversions and reversals. As new options markets become more active around the world these types of trades may be found again as the market adjusts pricing to usage, currency constraints, etc. This is accomplished by purchasing a call and shorting the underlying asset. Review the rest of the matrix below and bear this memory tool in mind as your further your studies. Just as we did with futures, we’ll go through the market participants and then cover how each participant uses these products and why. It’s always good to draw a quick table, separate types of users and see how they use the product. Understanding the logic behind each use of a product will allow analysts to design solutions based on specific decisions which fit their goals and objectives. 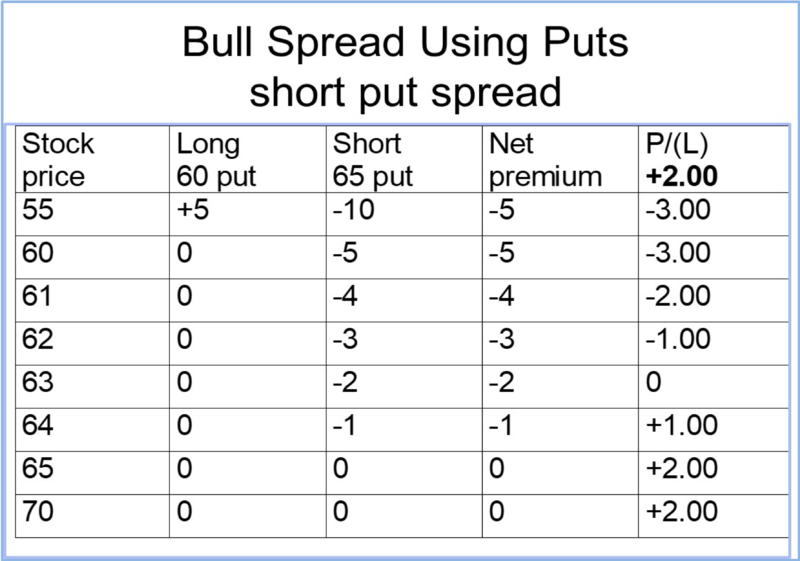 Single options: buying calls, buying puts, selling calls or selling puts are the four first profiles we viewed. We learning to calculate breakeven points profit potential and risk. Now we will look at those same options to list the specific participant and their chosen strategies. Source: MH Derivative Solutions, LLC. 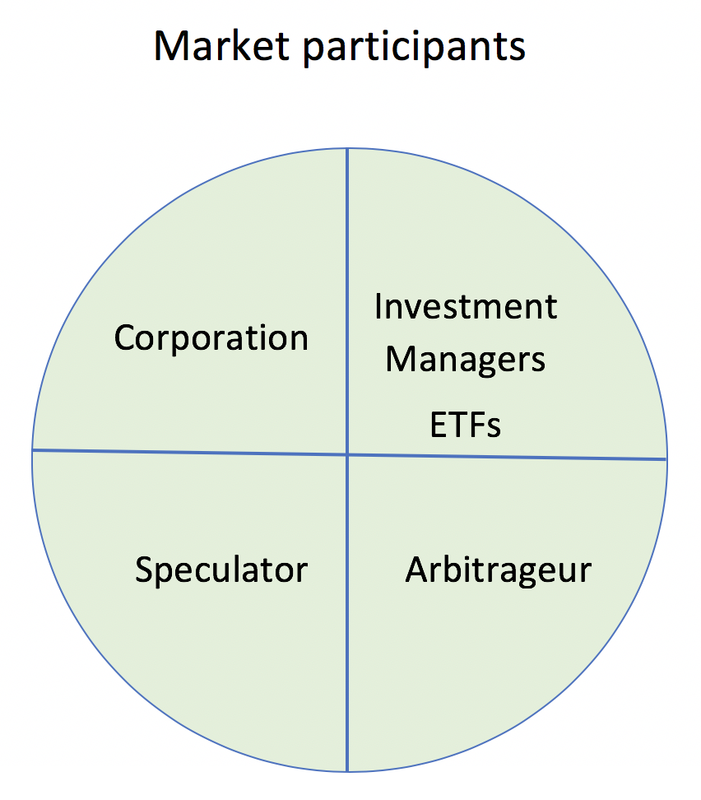 The participants who use options are the same four participants as Futures & Swaps. We’ll detail the strategies they use and their goals and objective for using these strategies. Keep in mind the note from the above graphic: unleveraged users of derivatives, use all of the products to hedge risk, the leveraged users use them to generate profits. These leveraged users profit rates looks very large, distorted by the leverage-factor of all derivative products. Issue Convertible Bonds: Low rated corporations will add an equity ‘kicker’. They purchase calls when they have a share repurchase program. Executive Stock Options can also be hedged with respect to the price of the common stock. Buy calls on stocks in which they’d like to purchase a minority stake. Trading desks called this a “starter kit”. Industrial hedges (i.e. Energy): hedging volatile businesses or products, writing a forward contract with another side of the business. Financial hedges: (i.e. Energy) hedging volatile businesses using futures. Here we’ve described the way they use equity options which is not a large % of their total interest in option products. Today, they are seen as the participant to use most asset classes to hedge their risk. 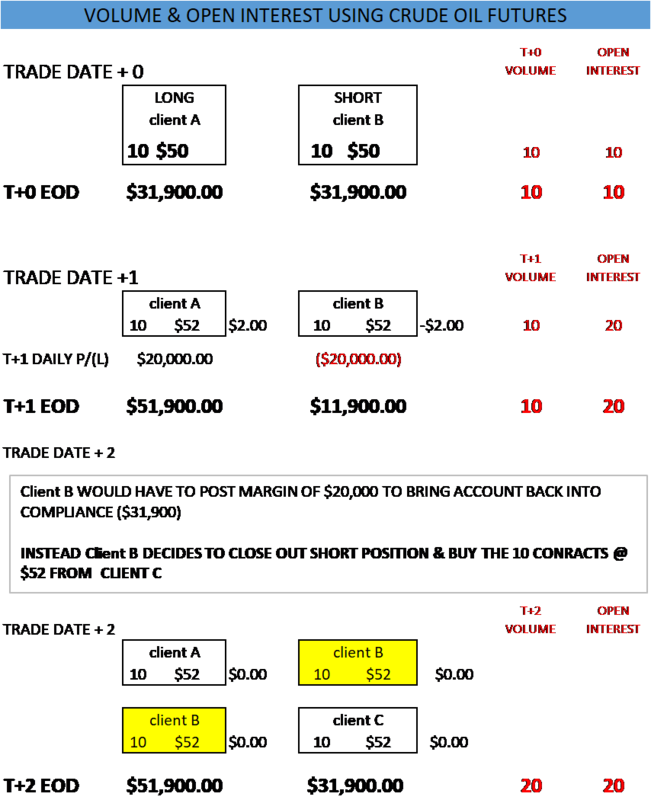 Sell calls versus long stock positions – with a systematically defined strategic way: Buy-Write, Put-Write, etc. Called an “anticipatory hedge”; managers purchase calls in advance of receiving more money to invest. N.B. : Condors are discussed in the more advanced courses offered via our LMS. Market Makers & Specialist use options in a similar way but for a totally different reason. In either case, here we’re speaking of a user transferring risk. They use one of several ways to manage this. We also draw a graph of the same intrinsic results. We’re not going into the same detail insofar as corporations. Corporations use derivatives in the context of their overall business risks. 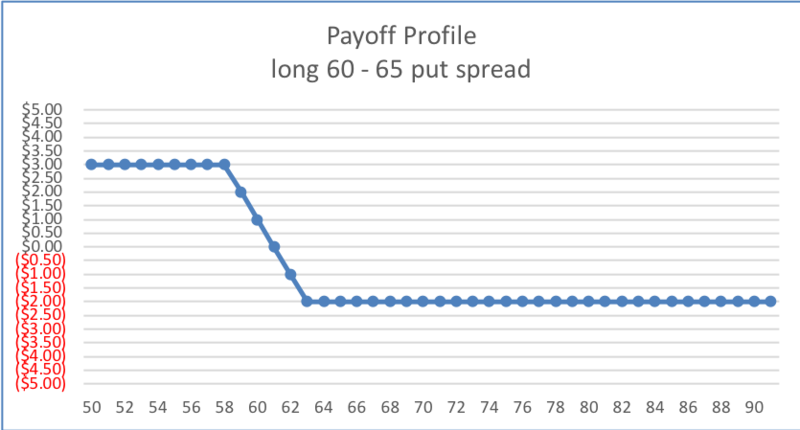 Referring back to the Knowledge Center on Futures, you saw a simple hedge strategy and how we adjust the number of futures to derive an optimal hedge ratio. Corporations using swaps and options will be covered under the advanced studies portion of the site, where we can look at case studies and discuss the topic in significantly greater detail. This module will cover Investment Managers, Speculators & Arbitrageurs. the option is in the money and the call seller needs to deliver the stock, generating the premium income. But the cost basis of the tock has gone down due to the options premium received. 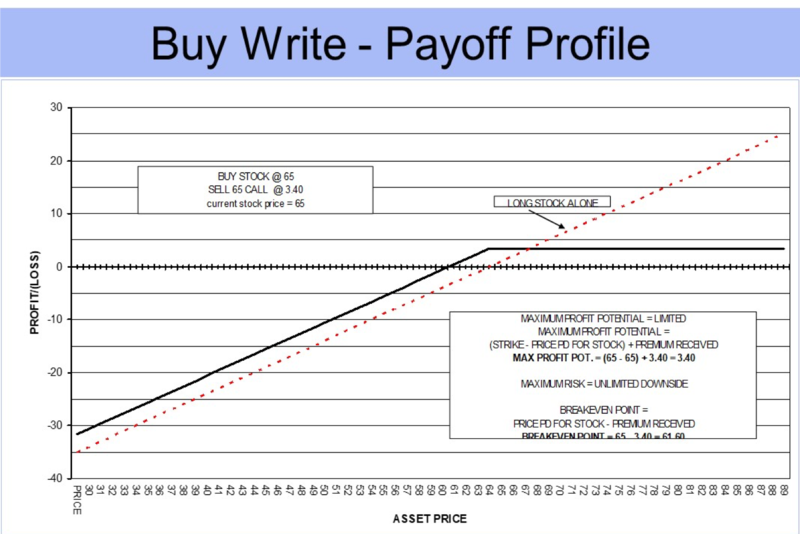 Below is the graph for the buy-write described above. Notice the dotted line shows the long stock position alone. 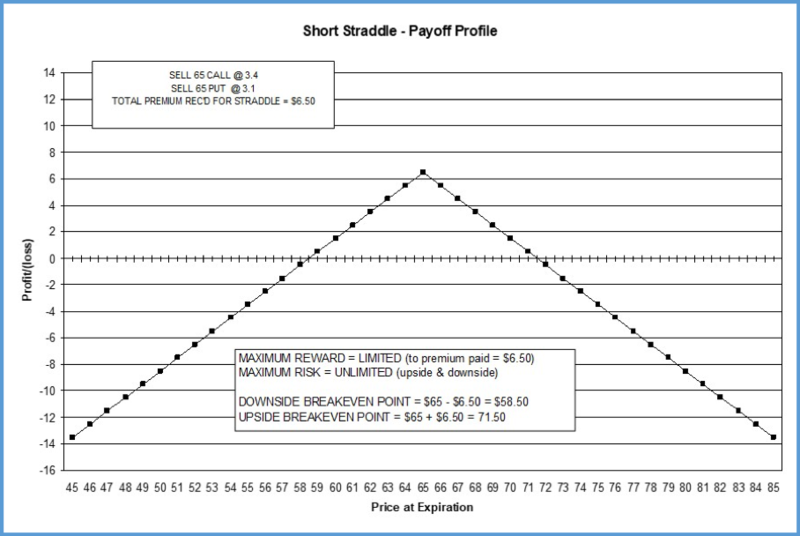 If you add the short call to the position, the buy write lowers your cost basis on the stock. At expiration if call is in the money, the short call will be assigned, and the long stock will be delivered against the short call. 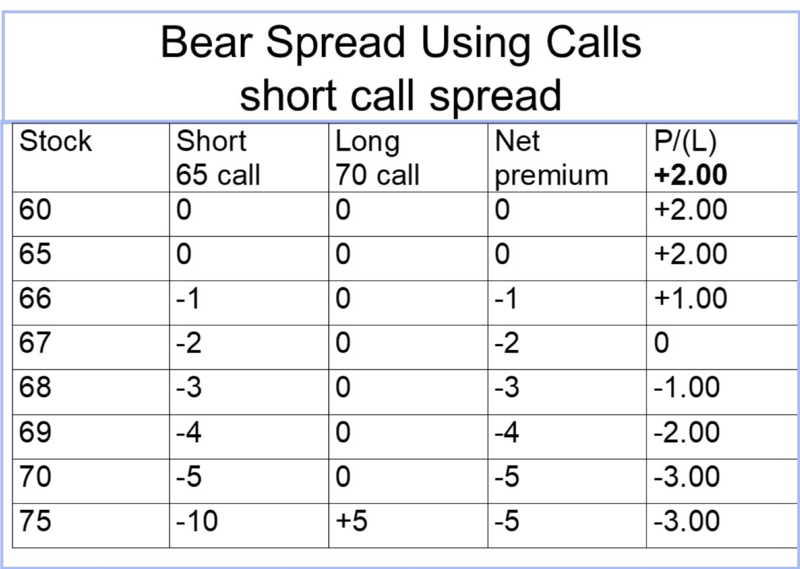 At expiration if call is out of the money, the short call will expire worthless. The premium received directly reduces the cost basis and continue to own the stock. buy the stock at the strike price if the stock is below the strike on expiration day. keep the premium if the stock close above the strike price at expiration. The downside is you don’t buy the stock if the stock goes up a lot more than the premium you received after expiration. 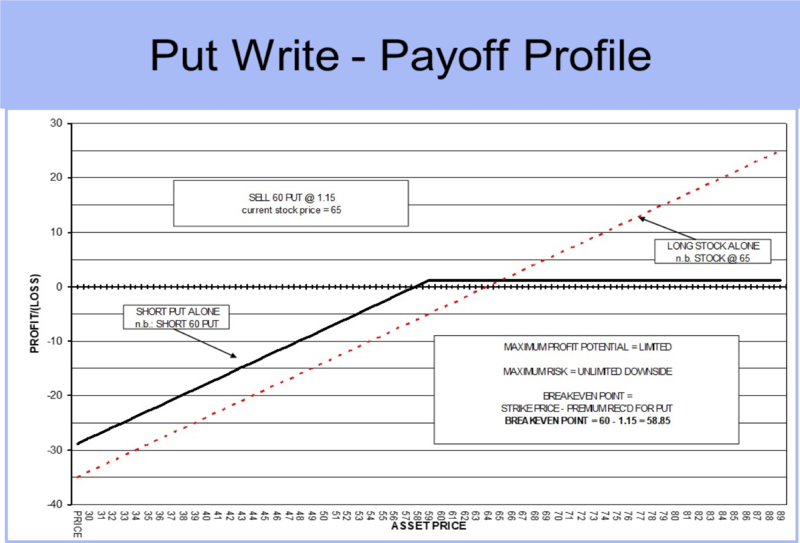 Below is the graph for the put-write described above. Notice the dotted line shows a long stock position (if we already had one). Instead, we sell and OTM put. At expiration if put is in the money, short will be assigned and long stock will be delivered when the strike price is paid. At expiration if put is out of the money, the short will expire worthless. The premium received will enhance performance of the short’s portfolio. Portfolio Insurance is use very differently today than it was back in the 1980s. Nowadays, managers purchase lots of out of the money puts when they’re cheap. Especially when their index requires them to hold a certain amount of stock. They’ll buy the protection for a shorter period of time. Butterflies have three legs. We talked about being long the straddle or strangle. When we were long we would make money is the asset moved BIG. With butterflies, it’s the opposite. 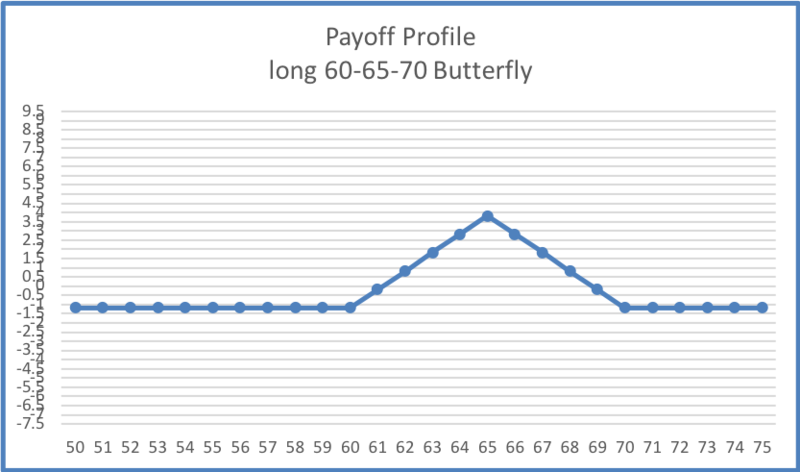 Long a 60-65-70 butterfly makes the most money when the stock doesn’t move from the ATM strike. But if it does move, you lose small. 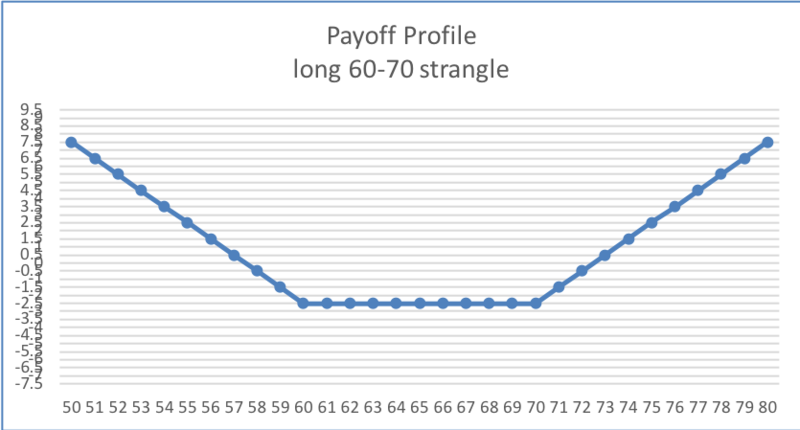 This payoff can be seen in the payoff graph below. 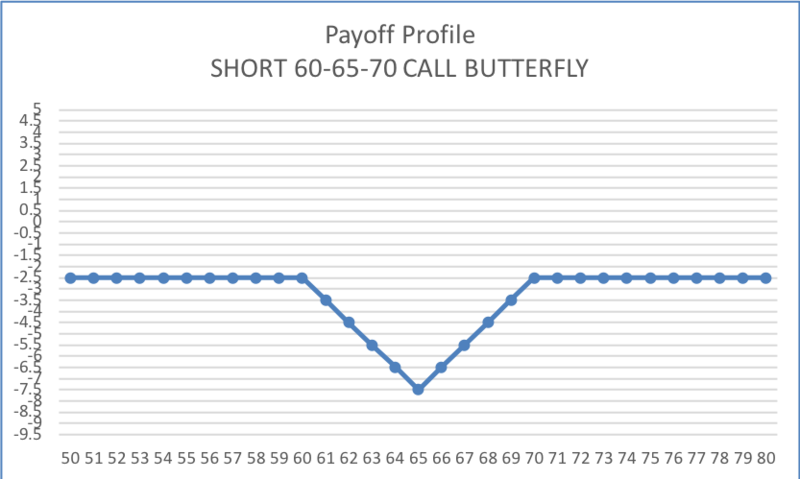 With a short butterfly you want the stock to trade in a wide range up or down. A butterfly’s payoff profile is the opposite of the straddle or strangle. Recall with the straddle & strangle, the short position is when we wanted the stock to stay still. With the short butterfly, we want a wide range in order to make money. This brief overview is meant to give you a glance at the normal strategies people use and why they’re using them. As you saw some of their strategic choices are limited by regulation, but for the most part, once the portfolio managers were on board, it was more easy to speak to their client. Corporations must provide details of all their derivatives positions in the 10Q- & 10K respectively. Corporations took the longest time to complete their documentation. Because they needed to receive approval from each portfolio manager and then from each client whose strategy was right for the use of options, it was a long process from sending docs out and receiving them back. Investment managers are careful to choose only those clients suitable to use options. Speculators are pretty easy. It’s just a matter of their account remaining flush with cash or equity and the KYC (Know Your Customer) process approving the client for a level of options usage consistent with their experience and knowledge of options, their overall goals as well as their capital. Arb’s or Market Makers, trading options is how they earn their living. They’re waiting patiently for their salespeople to get client interesting. They respond to client interest by making a market (a bid & offer) to the client. While they wait, they buy coffee for the sales team and treat them to lunch at noon. (caught ya… were you napping? Didjya believe it? 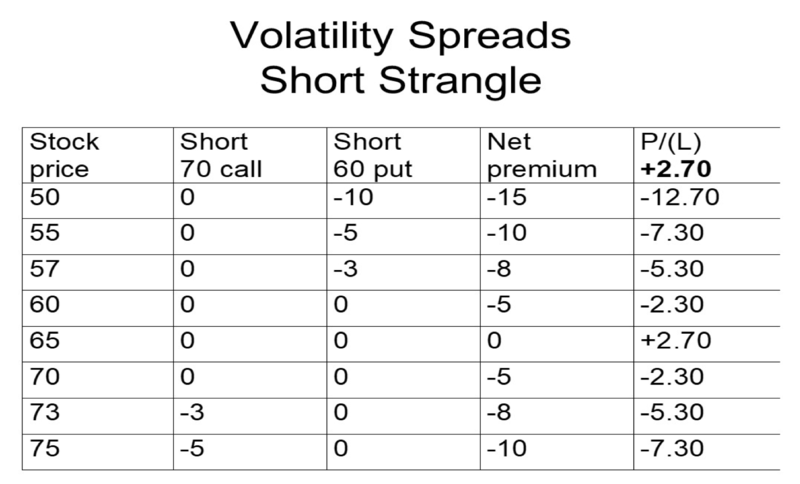 Don’t) In the 1980’s I spent most of my time trading options, so I was a volatility trader. 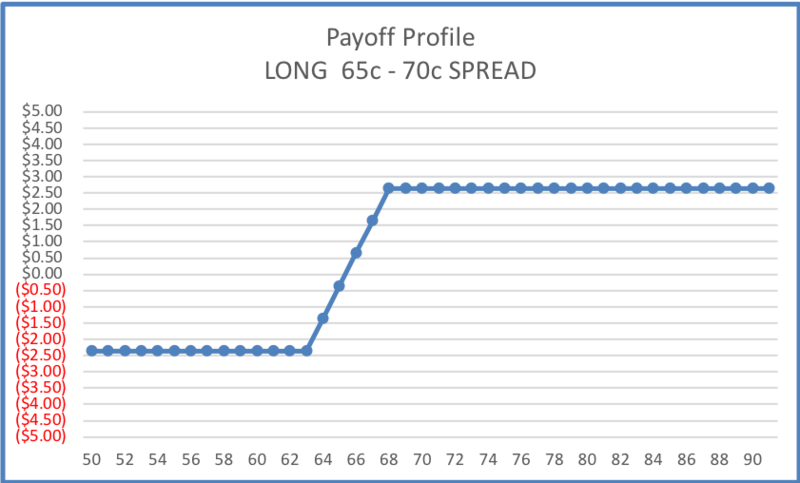 As the market grew and became more efficient, the spreads narrowed and profits shrunk. But there was a good 10 – 15 years where trading from the floor could give them a nice vantage point from which to make their money. “we pick up nickels in front of bulldozers. When the nickels turn to pennies, we find another game to play.” For me, that was a move up to our government securities and swaps sales team as the derivative specialist supporting the bond salespeople. 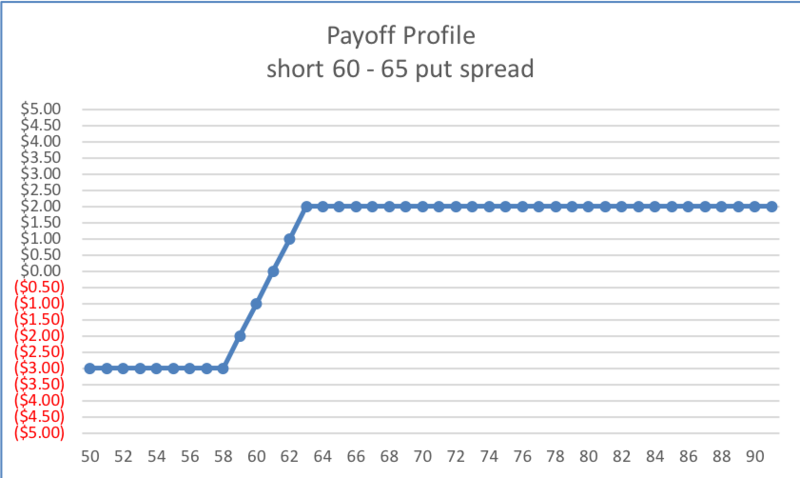 I’d like to show a simple example of a gamma scalping setup. When using options as a hedge we use specific terms to define each risk associated with how the risk management variable impact the price of the option. For some of the numbers they can be remembered easily using the first letter of the word. For others, you will find them quite easily memorized even without a memory trick. 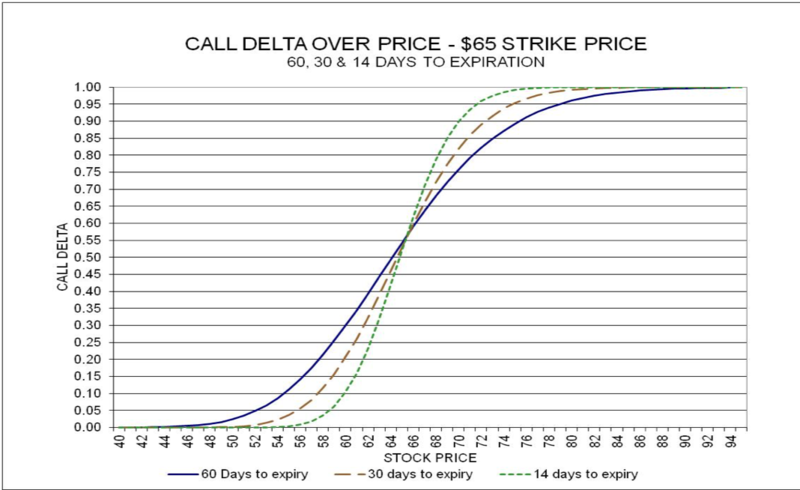 DELTA – Calculates how much the option will change for a $1 change in the underlying asset GAMMA – Calculates how much Delta will change as the underlying asset changes THETA – TIME: how much the option price will decay as time passes VEGA – VOLATILITY: how much the option price will change for a 1% change in volatility RHO – RATES: how much the option price will change for a 1% change in rates PSI: – DIVIDEND PAYMENT: measures a change in dividends paid during life of option For each Greek this section provides a definition of the risk measurement, followed by two graphs. 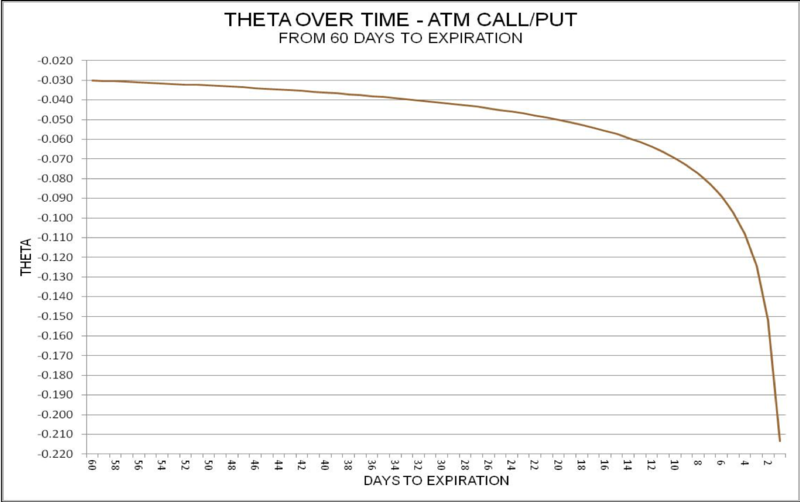 Each Greek is impacted by the price of the underlying and the time remaining to expiration. Notice the matrix below differs from the matrix in the first section. 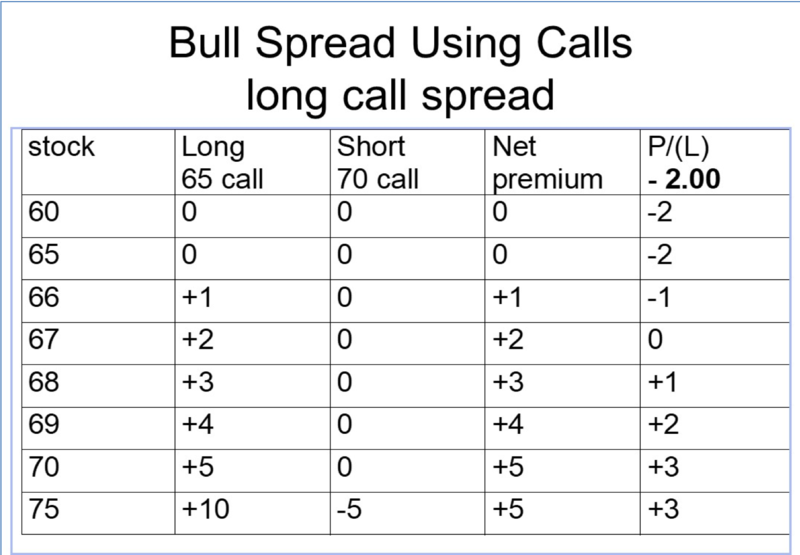 In this section there are three strike prices: the 60 call & put; the 65 call & put and the 70 call & put. An in the money call option would be, for example the $60 call. 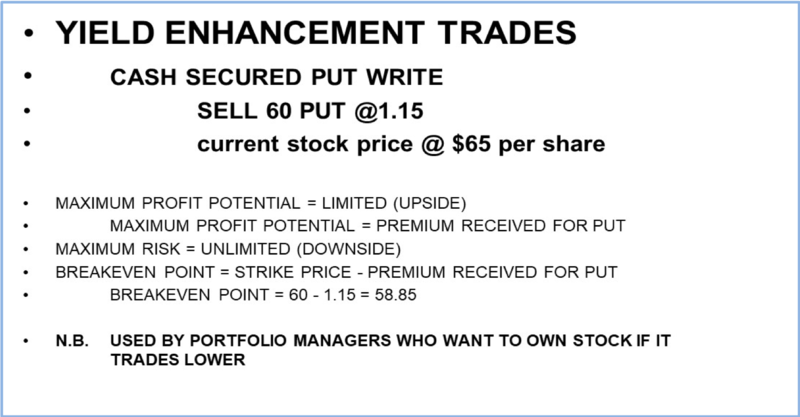 An option to buy the stock at $60/ share with the stock at $65 has $5 of intrinsic value. An in the money put option would be, for example the $70 put. An option to sell the stock at $70/share with the stock at $65 has $5 of intrinsic value. Remember: IN-the-money options have INtrinsic value. N.B. 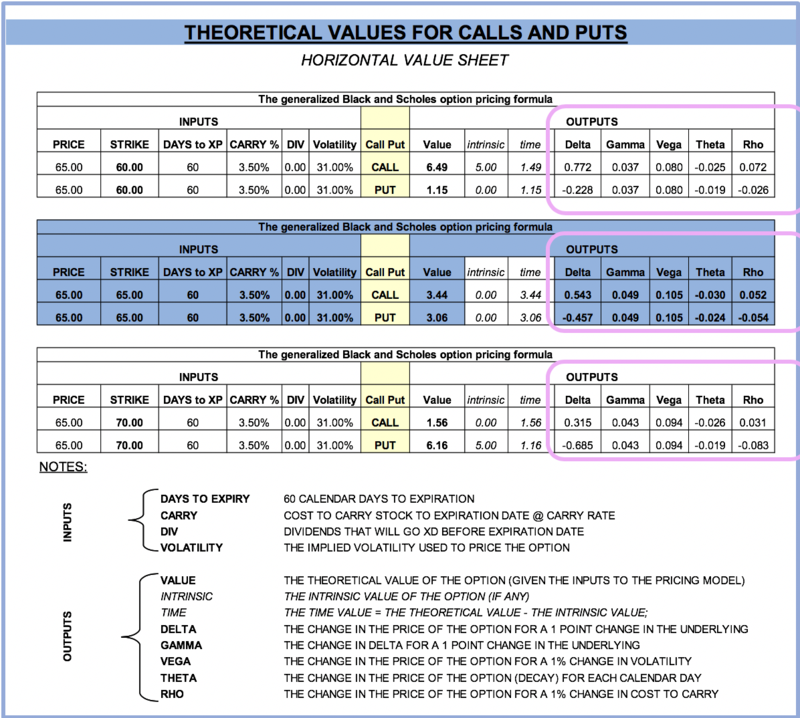 : Notice the theoretical value for the $60 call is $6.49. Less $5 of intrinsic value leaves $1.49 of time value. An out of the money call option would be, for example the $70 call. An option to buy the stock at $70/ share with the stock at $65. The premium is 100% time value. The stock would need to rise $5 or 7.14% to be in-the-money. An out of the money put option would be, for example the $60 put. An option to sell the stock at $60/share with the stock at $65 has only time value. The stock would need to fall $5 or 8.33% to be in the money. Reading the Matrix below from left to right starts with the inputs to the Black-Scholes pricing model. 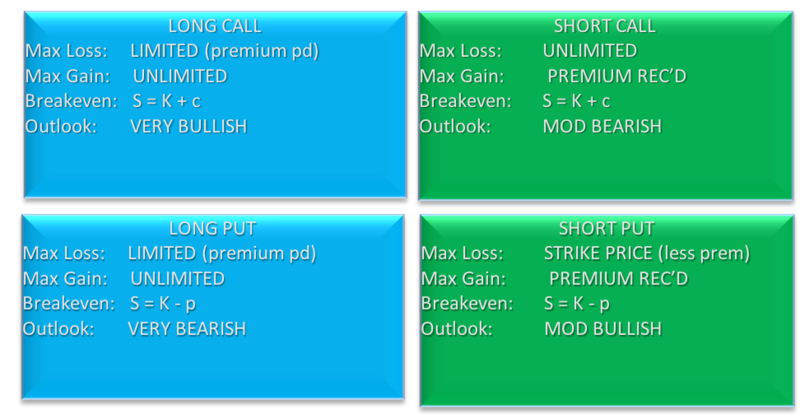 To the right of the words CALL and PUT are the outputs: Option price, Delta, Gamma, Vega, Theta & Rho. When studying each Greek all other variables are presumed unchanged to learn each risk management figure with respect to the variable we use it for. In our Membership program The Greeks are discussed in much greater detail. The second definition for delta: it represents the probability the option will expire IN THE MONEY. Consider this while viewing the graph below. The graph below shows the $65 call delta (X axis) as the asset price changes (Y axis). With the asset at $65, you will note the delta is approximately .50. In other words, there’s a 50% probability of the call expiring in the money. The graph below shows the put delta as price changes. 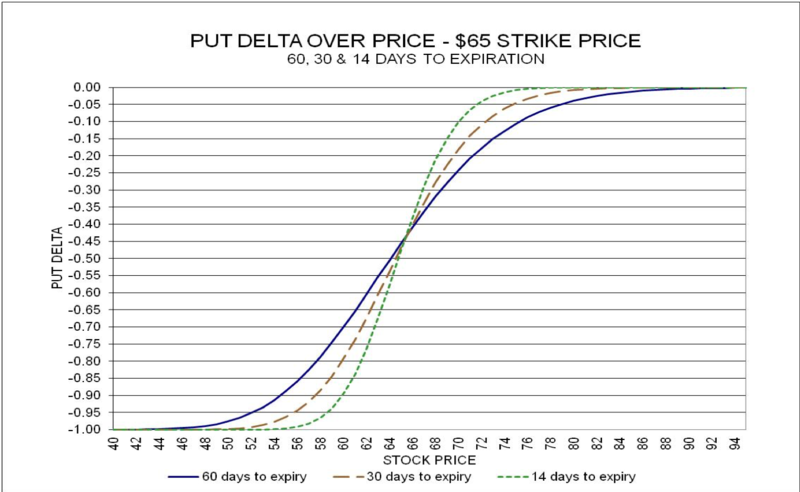 You’ll note the $65 put delta with the asset at $65 is approximately -.50. In other words, there’s a 50% probability the put expires in the money. The change in the price of a put with respect to gamma is also greatest At-The-Money and becomes lower as the asset decreases in price. Options risk over time is important to understand. Time’s impact on the price of an option is vital to understand how option risk changes as time passes. To understand each risk management number, We’ll define the risk over time, provide an example and show a graph of gamma over time. Notice below the graph of gamma over time. The slope gets steeper the closer the option gets to expiration. Inside of 14 days, the slope really ramps up. Bear in mind the graph below presue the aasset is unchanged at $65 per share for the entire 60 days. Also known as Time decay; it is a negative number shown most often one days decay. Theta and Gamma are related, as you learned more advanced concepts in market making you will better understand why this relationship is so important. 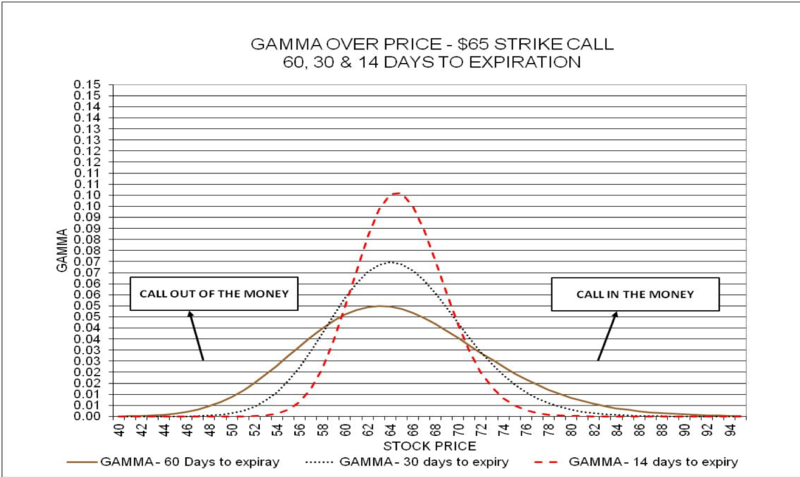 Out-of-the-money options gamma and theta have relatively low gamma and theta, regardless of time to expiration. 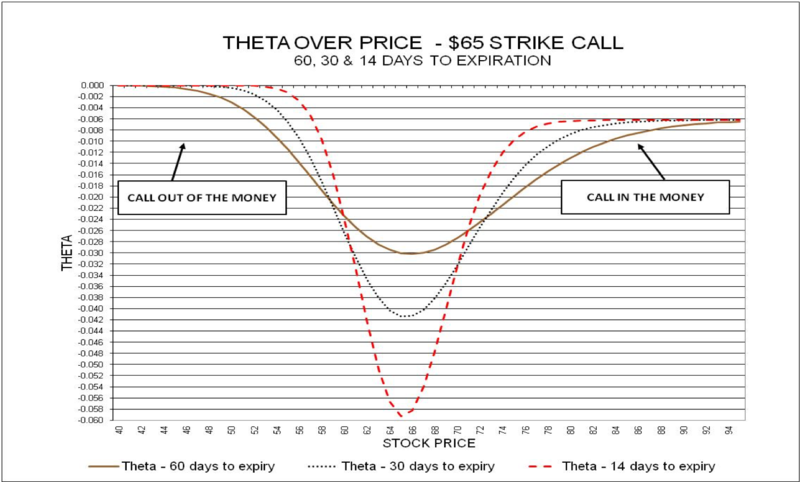 The theta of put is identical to the call. As with Gamma we saw no reason to repeat those graphs. It’s most important to understand the concepts. Theta over time increases (as a negative number) as expiration gets closer. 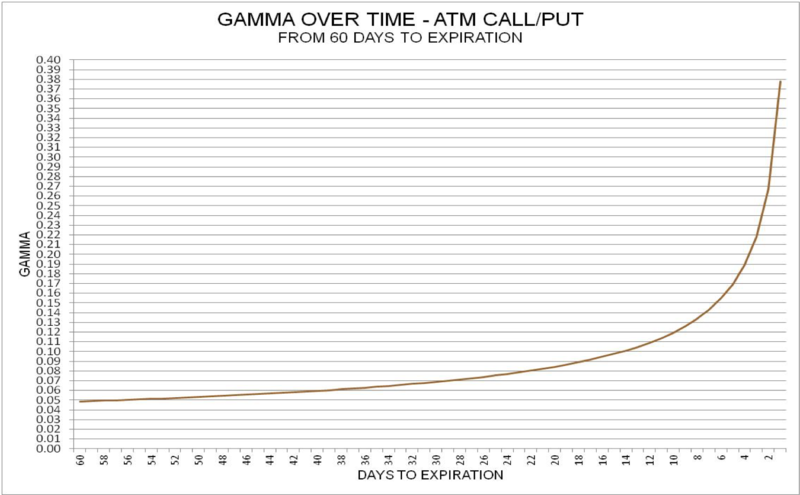 As with GAMMA, theta also slope becomes larger within 14 days to expiration. As premiums rise, implied volatility is higher. Our option increases .105 for a 1% increase in volatility. Vega is always a positive number for a long position; and a negative number for a short position. 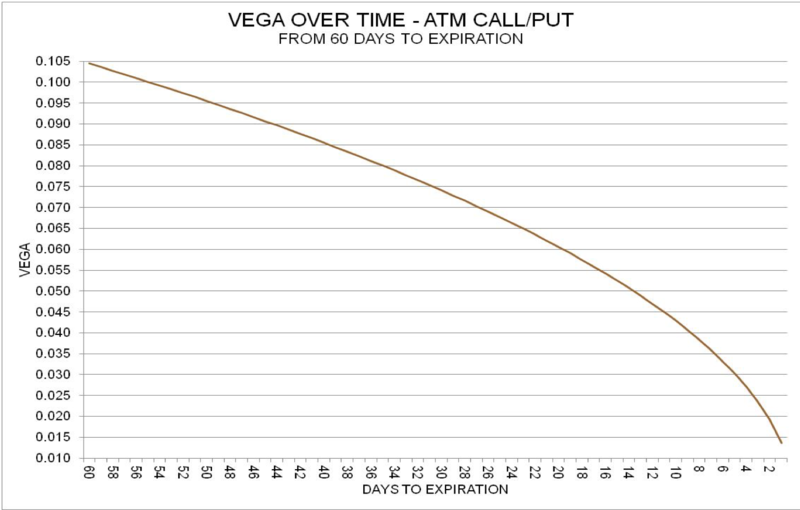 The graph below shows that vega decreases as time to expiration draws close. 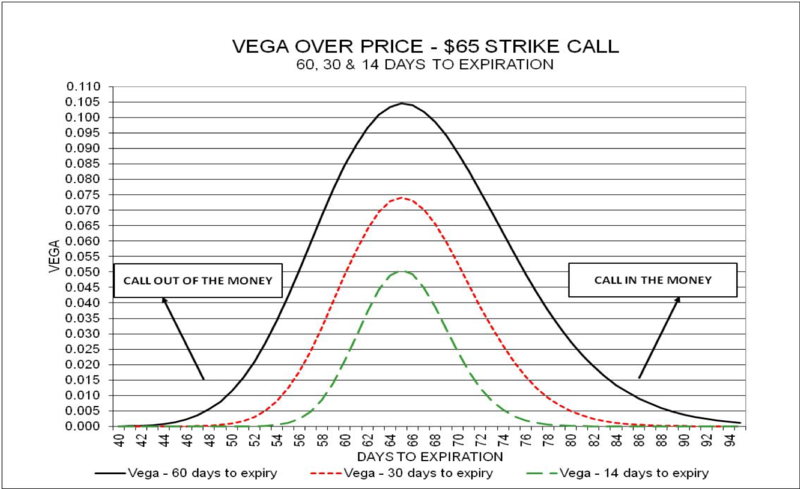 As your interest in more advance topics grows you’ll see how vega is used to trade earnings with little volatility risk. The knowledge center doesn’t cover Rho & PSI. This information is covered in the advanced material to separate the concepts of your primary Greeks to managing the changes in rates and dividends.